For millennia the eagle has represented empires as a symbol of formidability, prowess, and cunning. Popular in continental European heraldry we see the eagle represented on countless national flags and coats of arms. Regarded as the “King of the Sky” (in contrast to the lion’s title of “King of the Jungle”) the eagle is the kind of awe inspiring animal that has fascinated the human imagination since the dawn of time. As early as 540 BC Cyrus the Great was using the eagle as the symbol on his battle standard. The Ptolemaic rulers of ancient Egypt used the eagle as the seal of their empire. Albania translates to “Land of the Eagles” and Albanian translates simply to eagle. The ancient Romans saw the eagle as a companion animal to Jupiter, the Greek god Zeus was said to shape shift into an eagle, and the Germanic god Odin is often depicted with an eagle perched upon his shoulder. 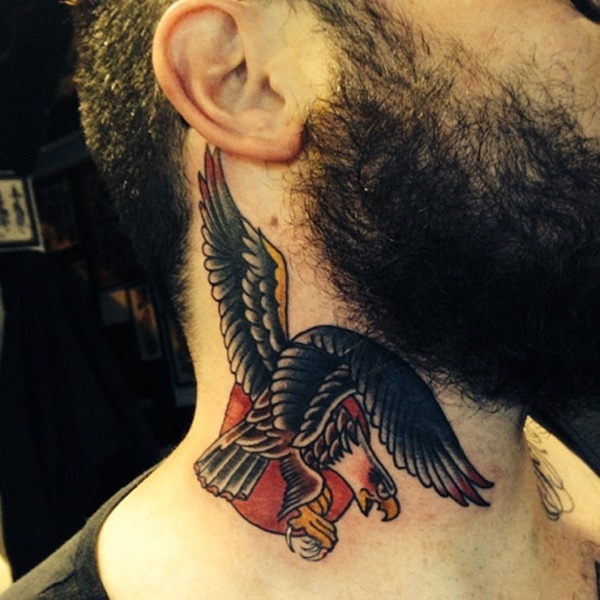 In this article we have compiled one hundred photos of impeccably well done eagle (and a few other birds) tattoos. 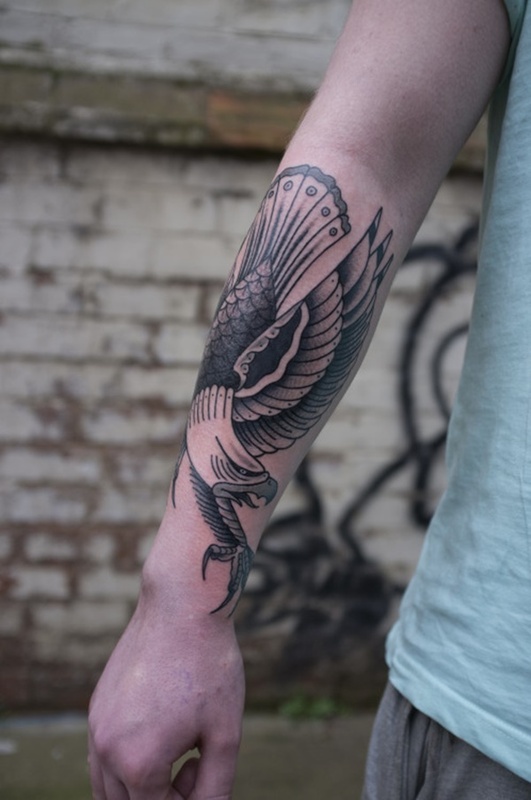 The images below can serve as inspiration for your next tattoo or can simply expose you to some phenomenal artwork depicting the world’s most fabled avian. In this image we see the silhouette of an eagle with its wings spread in flight. The wings have a geometric shape that is reminiscent of a wrought iron fence or Gothic architecture. As the wings extend the piece becomes more abstract, leading to the tattered coloration near the tips of the wings. This is a very traditional depiction of a Thunderbird. A bird of Native American folklore that is said to be a servant to the Great Spirit, responsible for rain fall, and capable of taking human form. Native Americans have described the creature as powerful, intelligent, and wrathful. 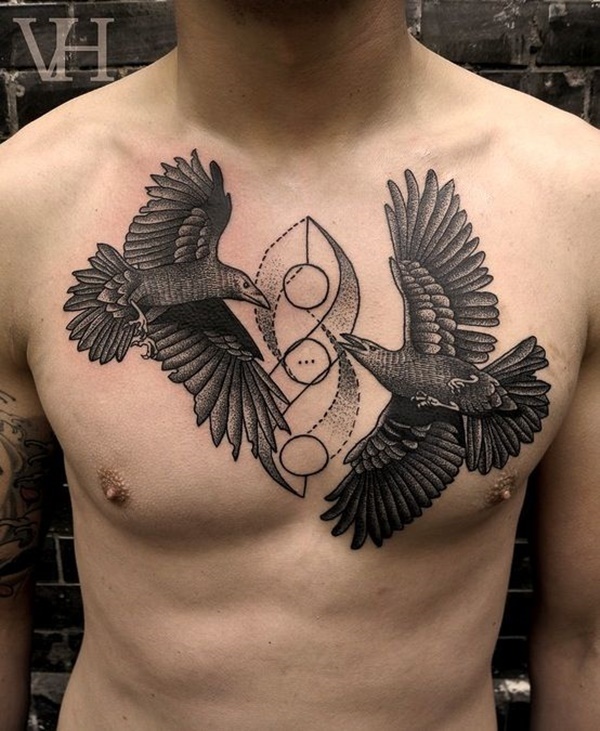 This tattoo depicts the bird in a stunning black and gray motif where the pronounced black lines are broken up by overlapping line and geometric patterns. 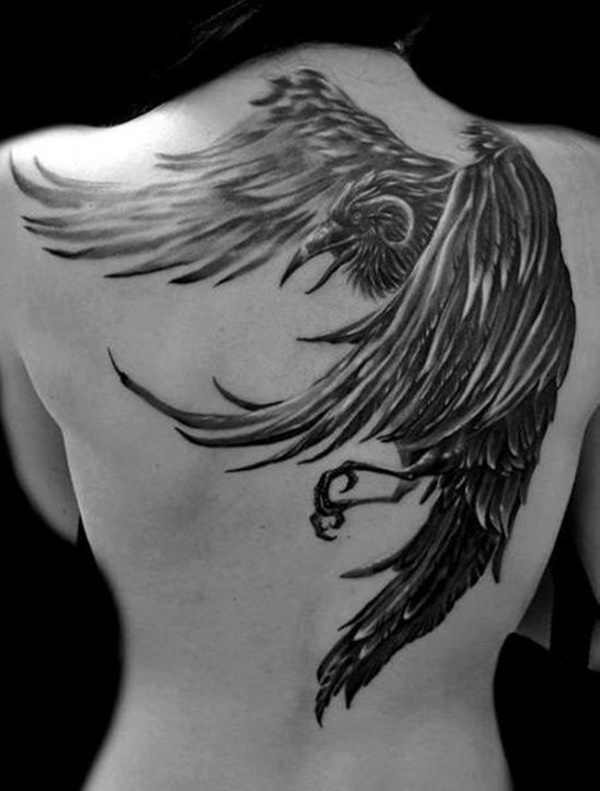 This back piece depicting a bird taking flight is an example of incredible shading throughout the predominantly darkly colored bird. 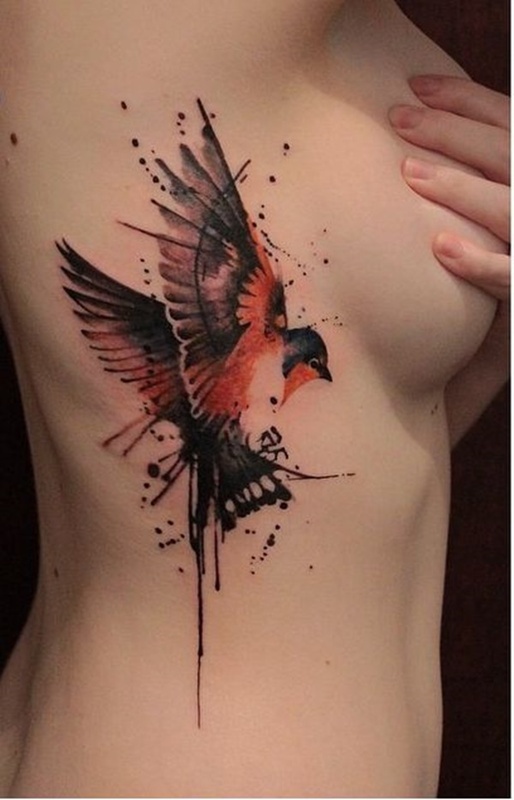 The contrasting colors throughout the tattoo give the piece depth and accentuates the bird’s features. A beautiful abstract depiction of the wings of a bird leading into a tree trunk. The absence of color is what draws your eyes to the silhouette and leads them to the tree that crawls up the nape of her neck. A very traditional depiction of a southwestern Thunderbird. 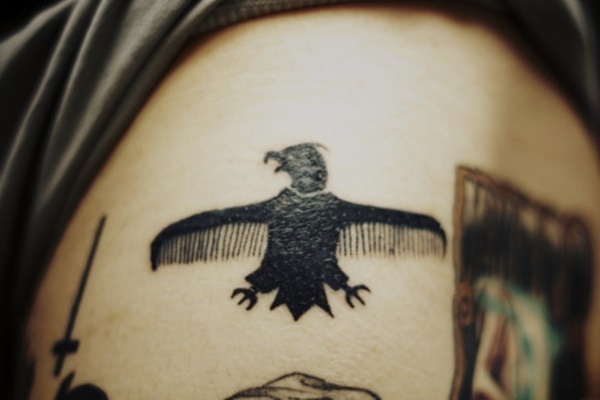 The appeal of this piece is its location, the Thunderbird was said to create thunder with a flap of its wings, making the hands an ideal location for a Thunderbird tattoo. 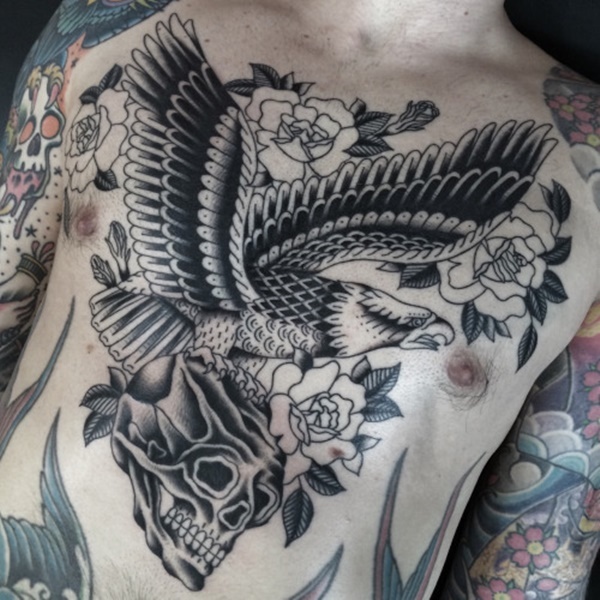 The cage creates the background, the geometric pattern the middle ground, and the eagle is placed in the foreground making it the focal point of this tattoo. 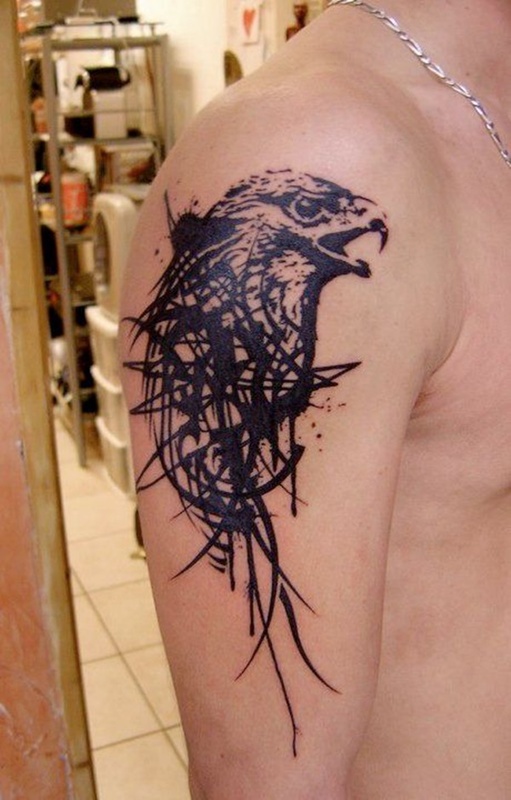 A very simple black profile of an eagle’s head that leads into an abstract series of lines reminiscent of paint running. The title says it all. 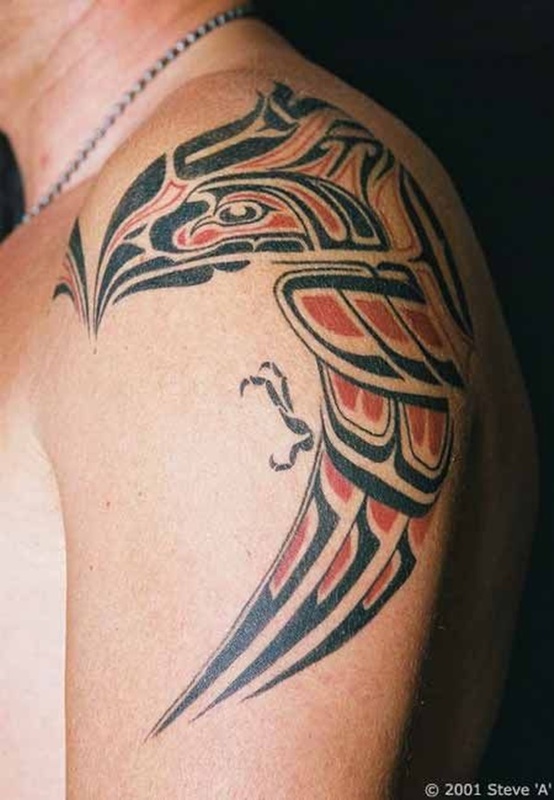 This is a very simple, yet elegant, side profile of a flying eagle with an ode to Native American art style throughout the body of the bird. This image is a representation of traditional western tattooing, specifically naval tattoos. The eagle wraps his talons around a skull and is embellished with the American flag and the slogan “Freedom is Not Free”. This tattoo emphasizes placement. 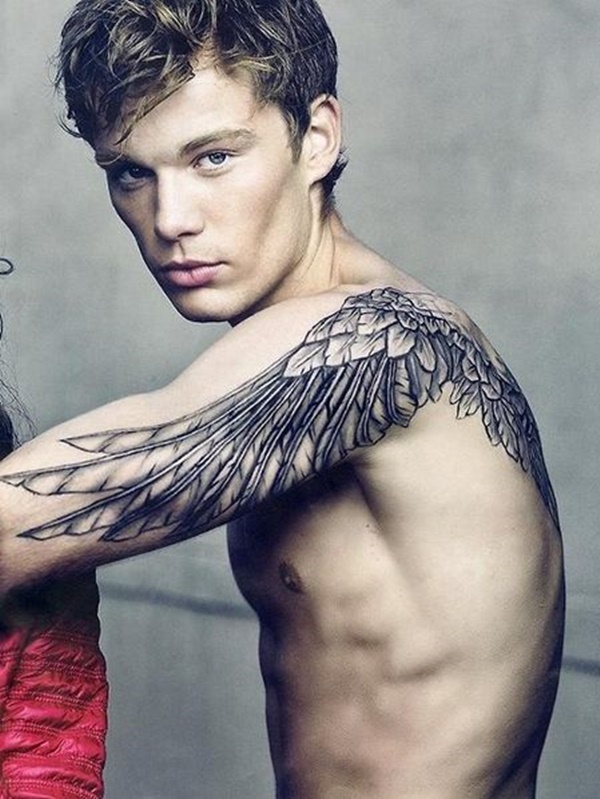 Especially advantageous for people with long hair, a tattoo behind the ear can be easily concealed. 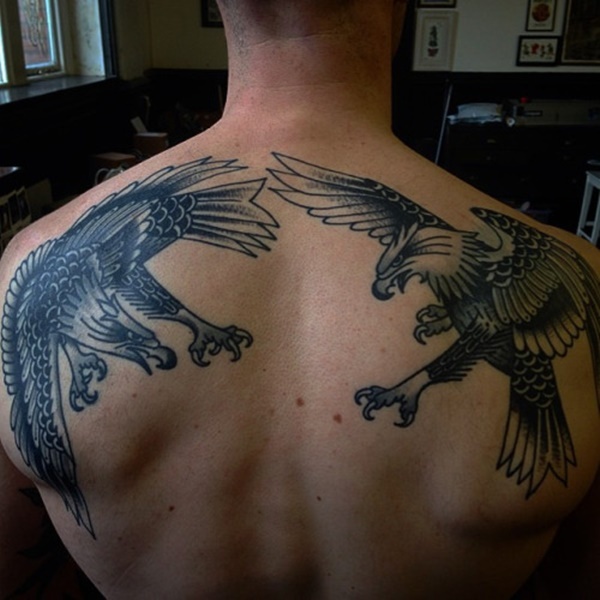 A mirrored image of a stalking bird on each shoulder creates symmetry in the piece. A set of detailed eagle’s wings attached to what I presume is a hour glass. Take note of the line work throughout the wings. A crow depicted in a style that simulates a pencil sketch, an example of superb shading. Depending on the skin tone of the person being tattooed, white ink can be used to accent a black and grey tattoo so the colors don’t merge into an unidentifiable grey blob. 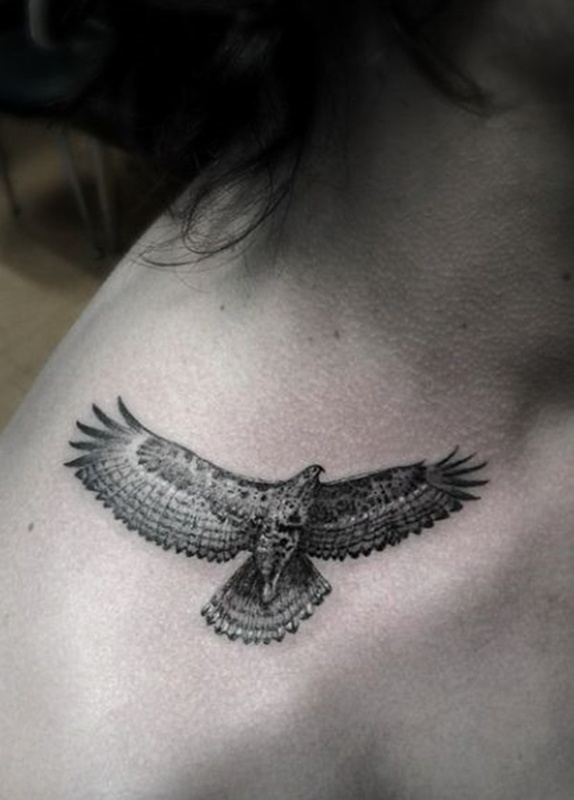 This is a great example of patterns used throughout the eagle drawing your eye systematically through the entire tattoo. The profile prominently displays one of the eagle’s most recognizable characteristics, its powerful hooked beak. A remarkable example of simple and efficient tattooing. 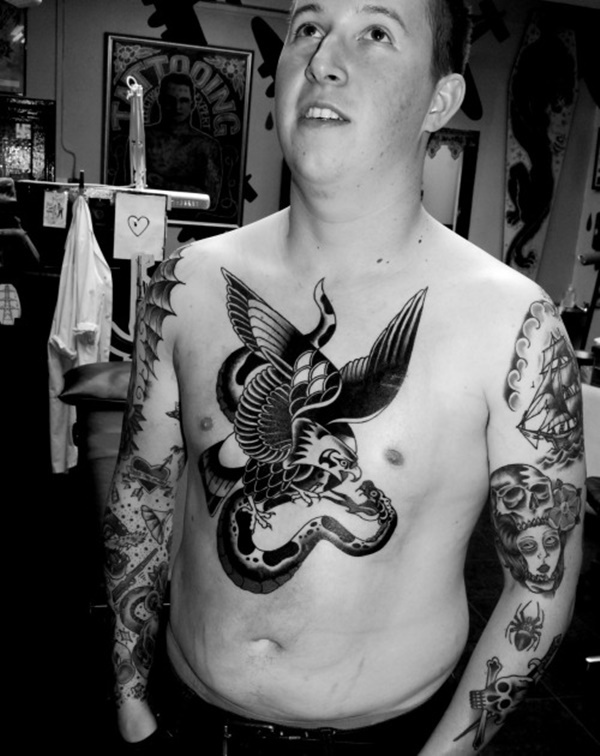 A wonderful example of tribal style tattooing. A series of shapes creates an outline and the mind completes the image. 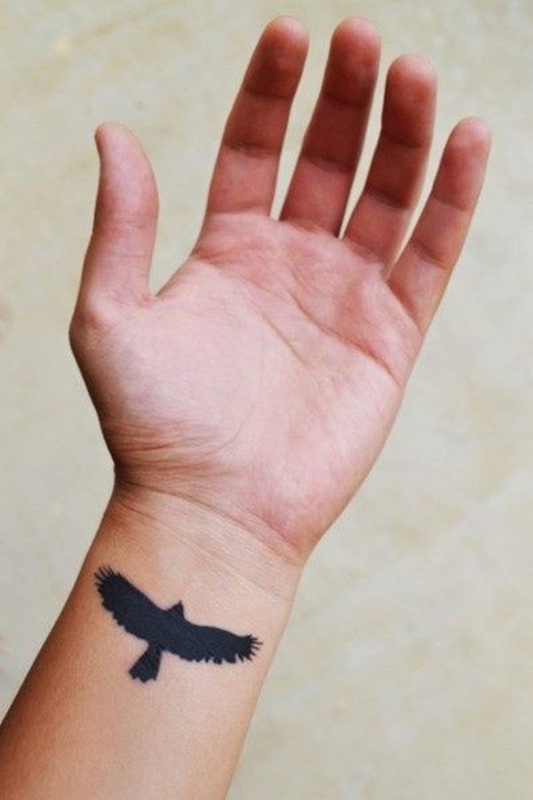 A realistic depiction of an eagle’s wing extends the length of their forearm. Notice the subtle shading that imitates the small hairs that comprise every feather. 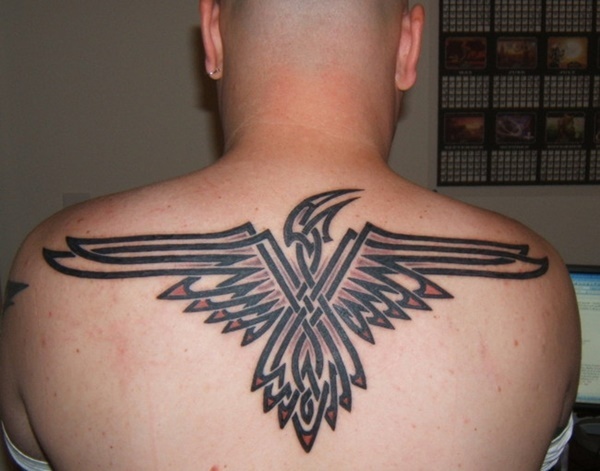 A solid black depiction of the Thunderbird symbol. 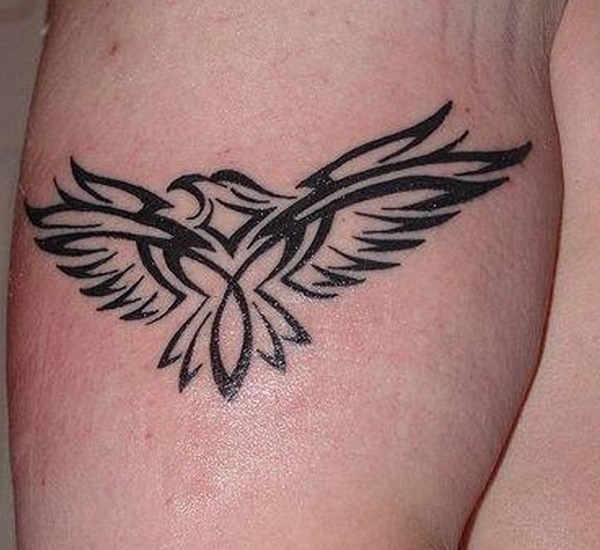 Where this tattoo differs from the other representations of Thunderbirds in the list is the placement. 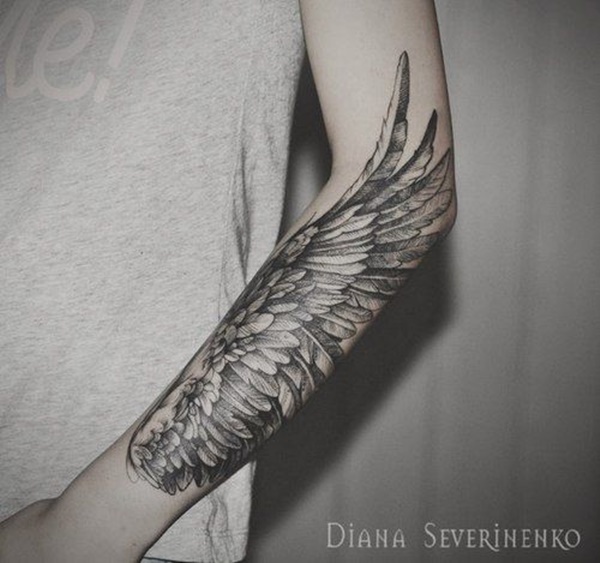 The wings of the bird wrap around her forearm creating a banded effect. 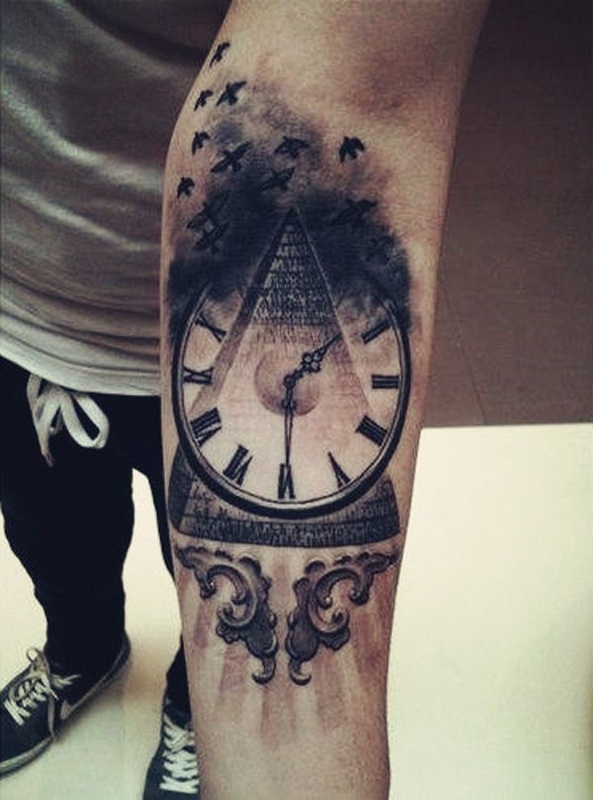 A clock superimposed over a pyramid creates the foreground of this tattoo while the background shows the silhouette of a flock of birds fleeing the pyramid. 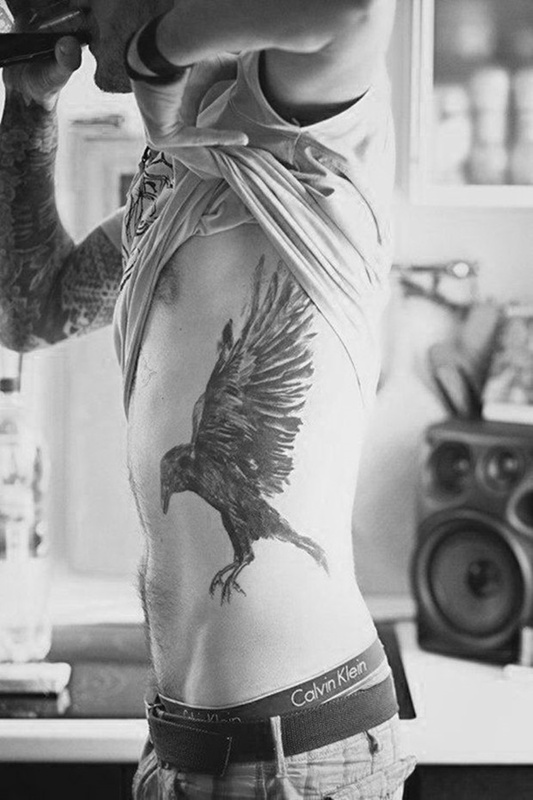 Notice how the birds ascend up his arm and not simply away from the tattoo. The double headed eagle is a prevalent symbol in heraldry, the two heads are said to represent the North and South or the East and West. 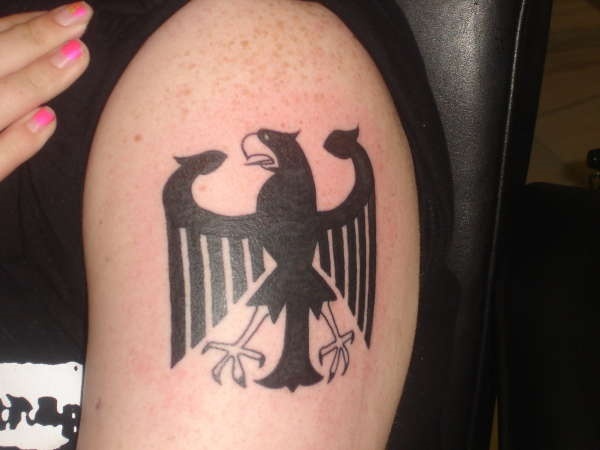 Here we see the double headed eagle accented with an eye in the center and a geometric shape above. 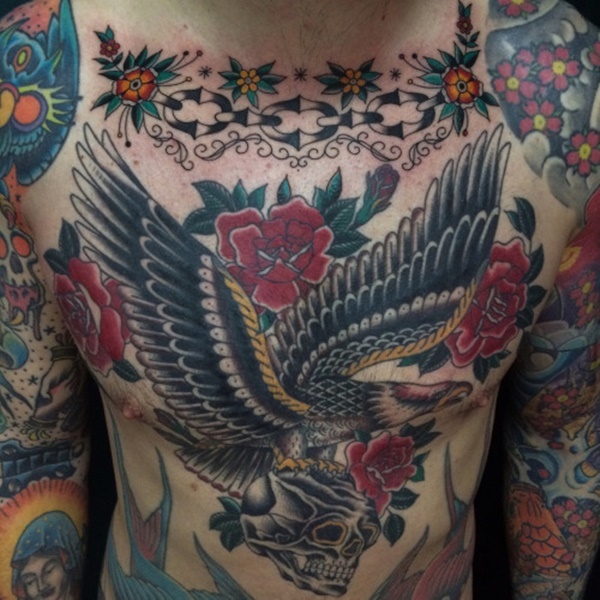 Eagles and roses have been popular images for American Navy Sailors for decades. Here we see the eagle as the centerpiece with complimentary roses scattered throughout the piece. It should be noted that this is an outline without shading or coloring. 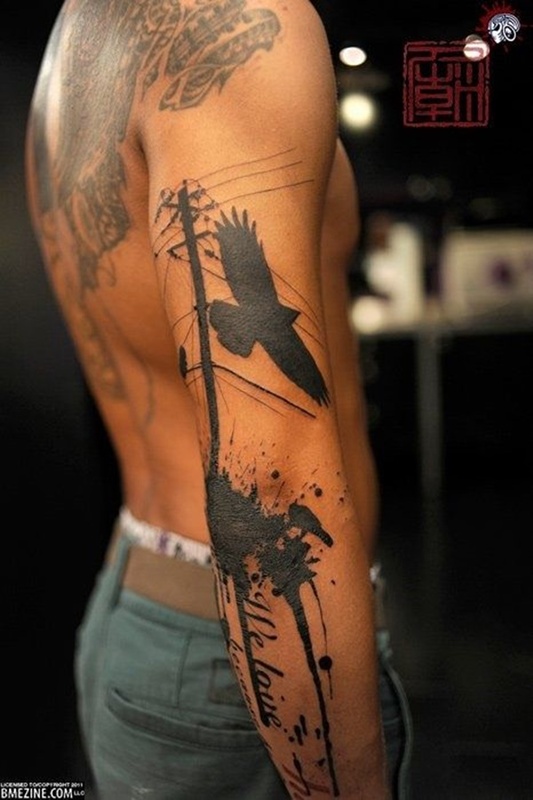 While the top of the tattoo seems relatively simple, the true beauty is in the ink blot at the base of the pole. 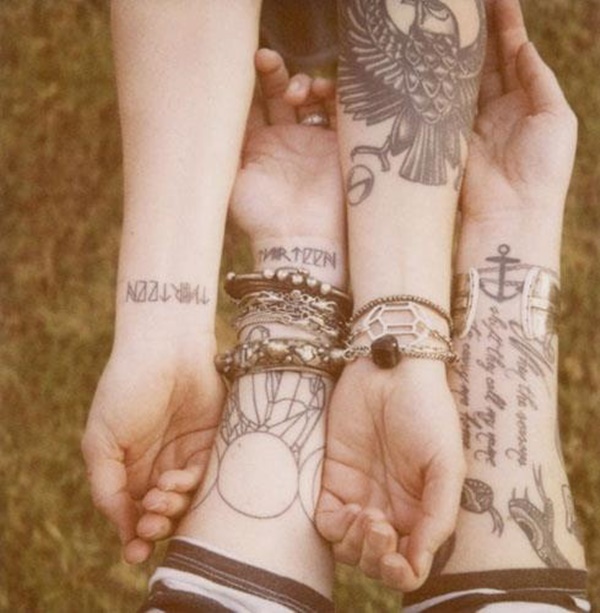 We see the ink running down the man’s forearm and text written on the lines. A nice twist on an otherwise basic tattoo. 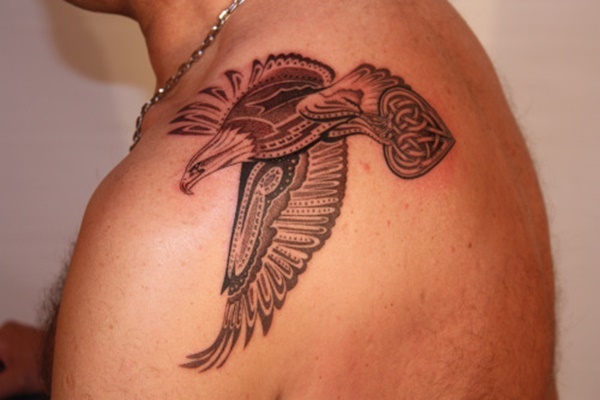 Within the shape of the bird is a series of patterns and shapes prevalent in Celtic symbolism. The white shapes really pop against the black background. A realistic image of a bird taking flight while its head hangs low. 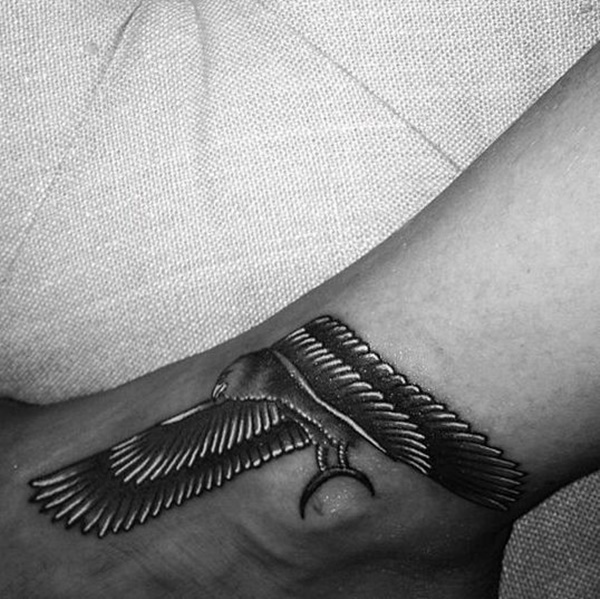 This tattoo conveys a feeling of solemness as the bird’s head faces the ground and not the viewer. 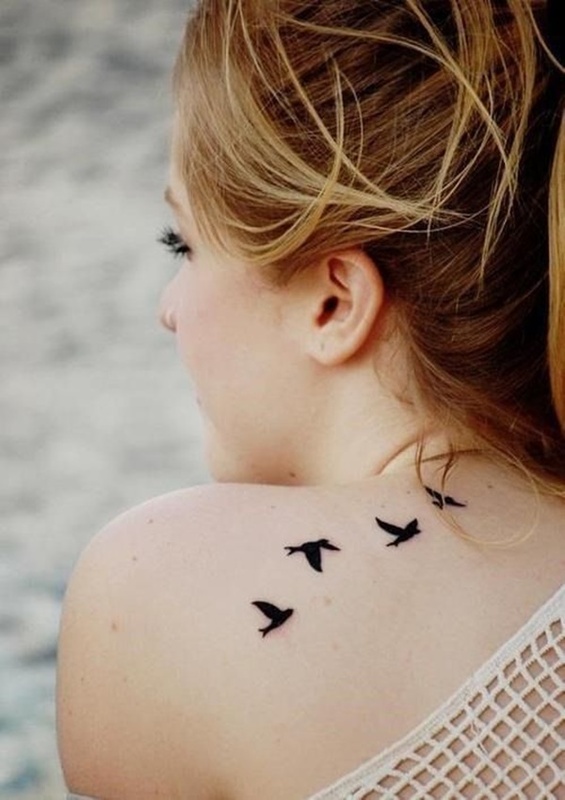 A small series of tattoos showing a bird in various stages of flight is a simple, elegant example of silhouette tattoos. 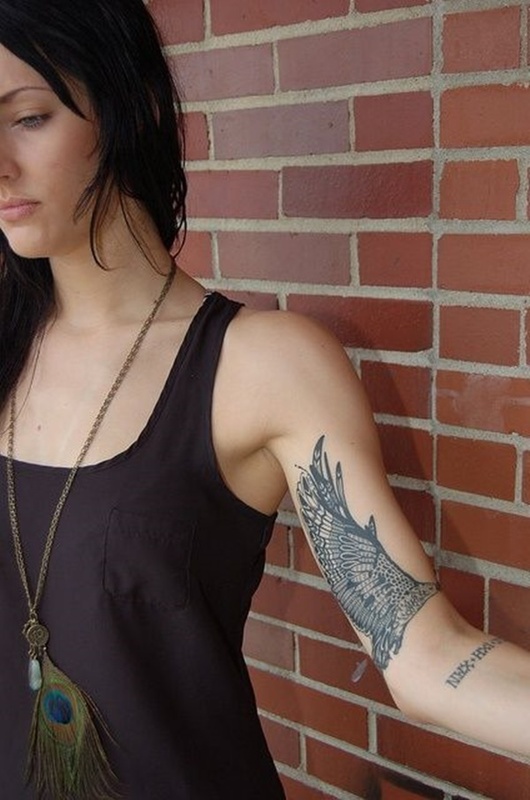 Her skin tone creates an ideal contrast for the rich blackness of the tattoo. The beauty of this tattoo is in the color palette. The selected colors create a sense of surrealism in otherwise life-like portraits. In Albanian mythology the founder of Albania was promised the “Power of eagle’s wings” for returning an eaglet to its mother. 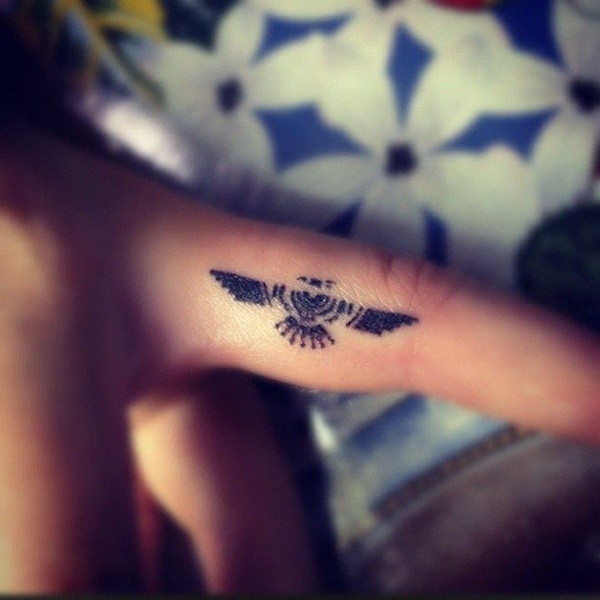 This tattoo is a symbolic representation of that concept. A palette of black, grey, red, and white creates contrast in this self-styled coat of arms. 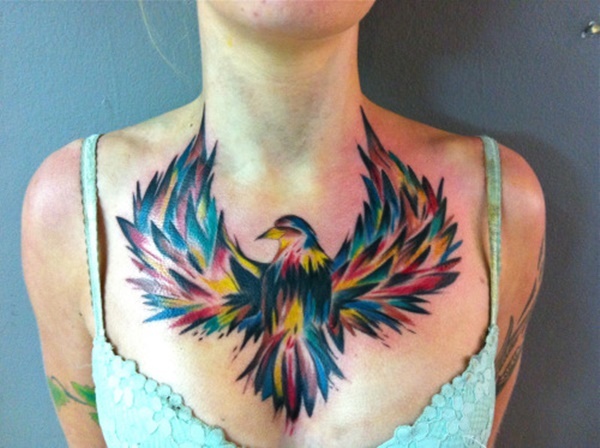 An explosion of color and traditional tattoo symbolism composes this tattoo. 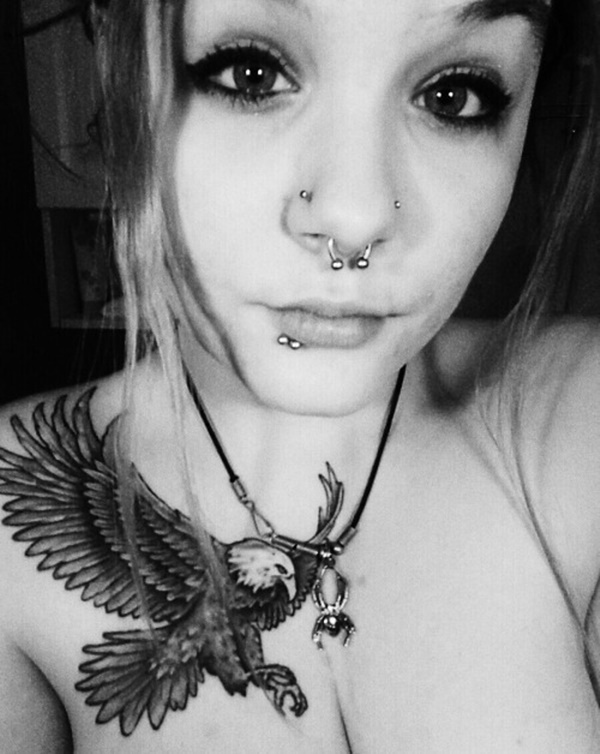 The eagle and rose are pitted against the sparrow and lotus, while a sword pierces a heart as the centerpiece. 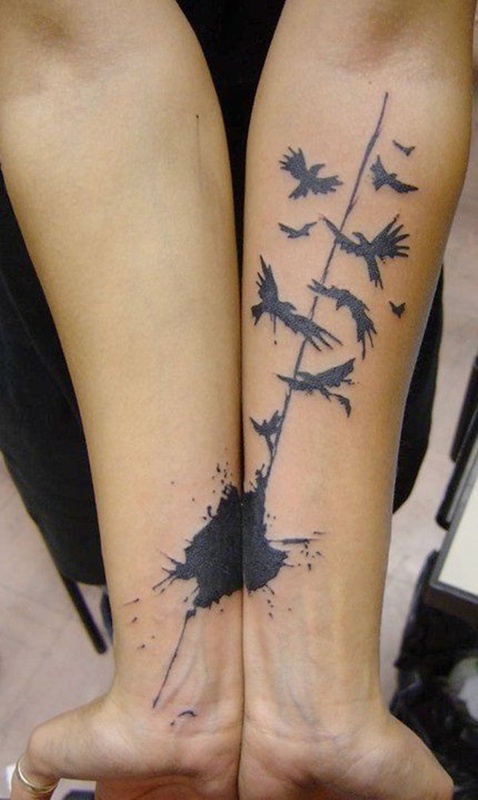 A series of abstract silhouettes depicting birds with noticeably jagged wings leading to an ink blot near this woman’s wrist creates a very unique image. 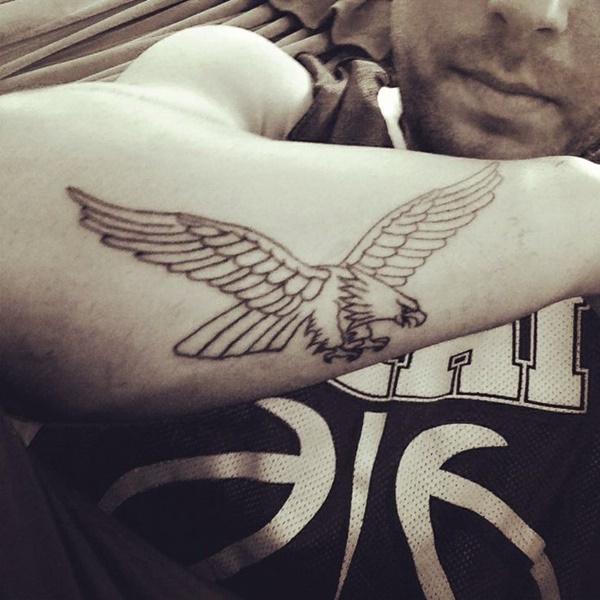 As a native Pennsylvanian I immediately recognize this tattoo as the old logo for the Philadelphia Eagles football team. The absence of shading and color creates a very pronounced image. A stylized top view of a bird flying with a few stalks of wheat sprouting from the left wing speaks to the personality of the wearer. 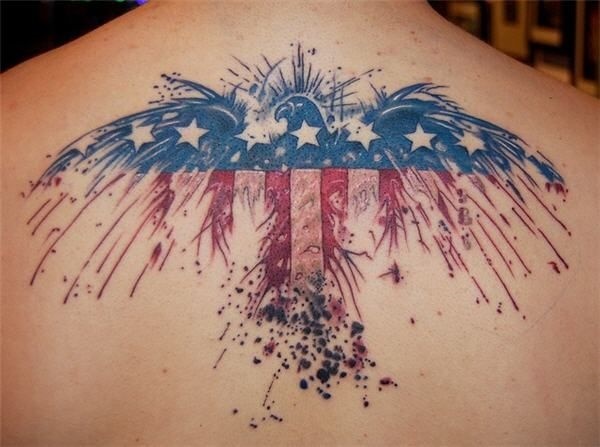 A hyper-patriotic eagle clad in the stars and stripes of the US flag, the ink splatter frames the image nicely and draws the eye to the center of the piece. 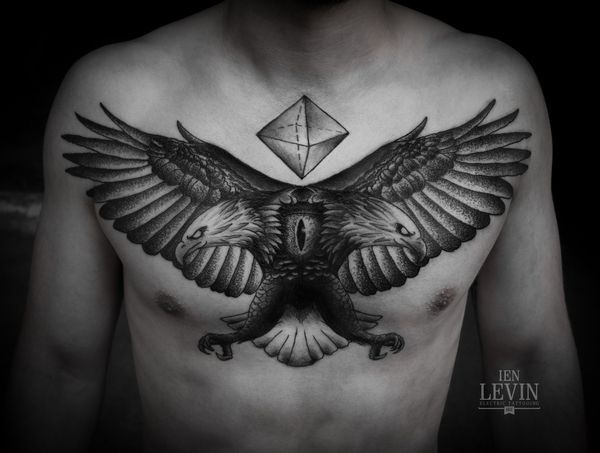 Two birds clash for ownership over the geometric shape reminiscent of a double helix on the wearer’s chest. A top view with hints of Native American styling. 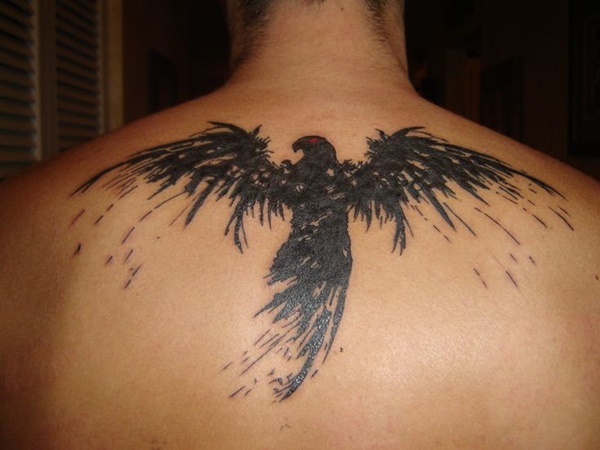 While the tattoo may appear dark now as time passes the ink will lighten and emphasize the shading. 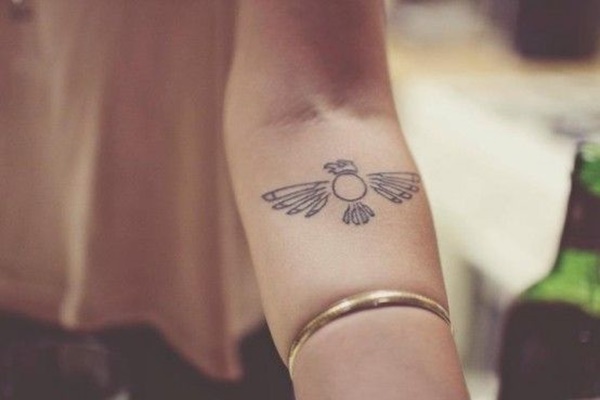 A pronounced outline of a Thunderbird compliments her forearm perfectly. The eagle is represented in an aggressive posture with a craned neck and outstretched talons. Invoking the idea that the predatory bird is about to swoop down on some prey while unleashing a screech. 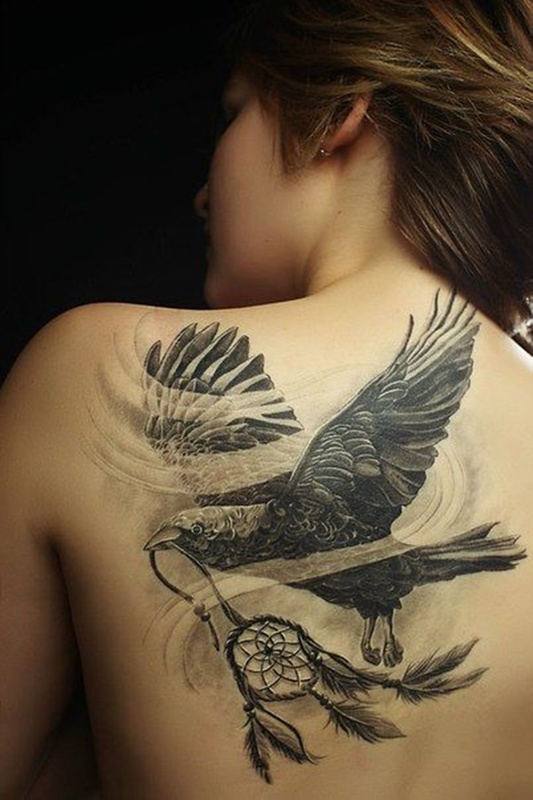 The winds push through the wings of the bird as it carries a dream catcher. The dream catcher is a Native American invention said to filter out negative dreams and allow only positive thoughts to enter the sleeping mind. The limited color palette of red and black creates an ominousness in this ink splatter eagle. The ink splatter adds character to an otherwise simple picture of a robin, while the choice of colors in this piece create an heir of femininity. A simple top view, black silhouette. Here we see elements of an eagle represented on a totem. 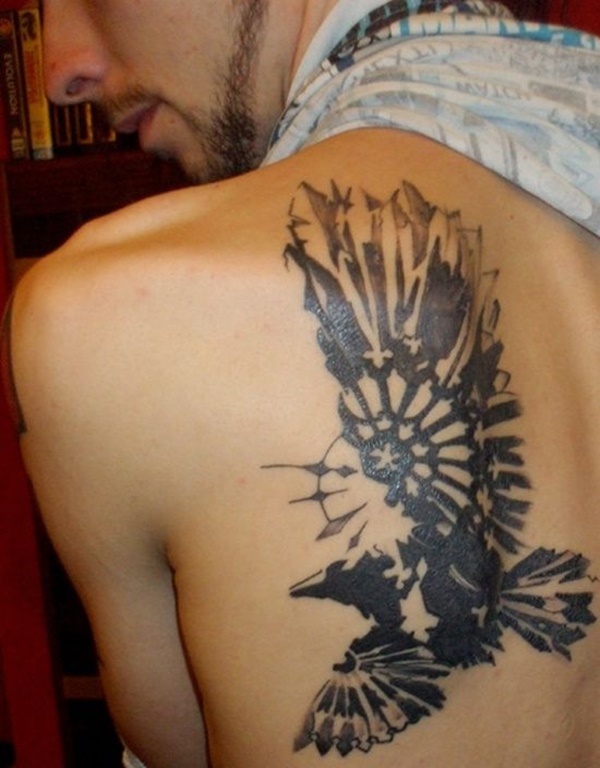 Notice the face in the middle of the piece as well as the face at the top of the tattoo with the hooked beak of an eagle protruding from one side. Totems are spiritual objects or sacred beings in Native American culture. They represent the lineage or mythic past of a clan or tribe. 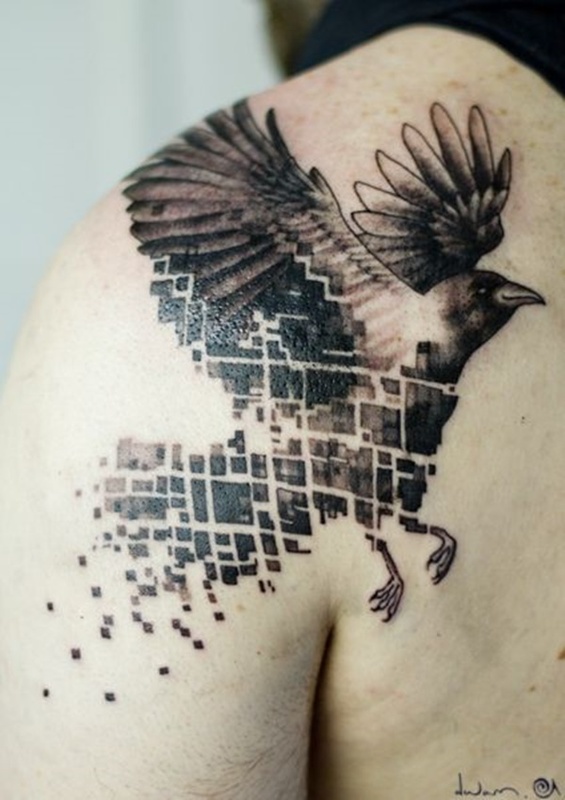 Here we see a typical portrait of a bird, however as your eyes travel downward you can see the bird is being deconstructed into a series of digitized cubes. The style of this tattoo beckons a pencil sketch, with the darkest part in the center and gradually lightening at the edges. 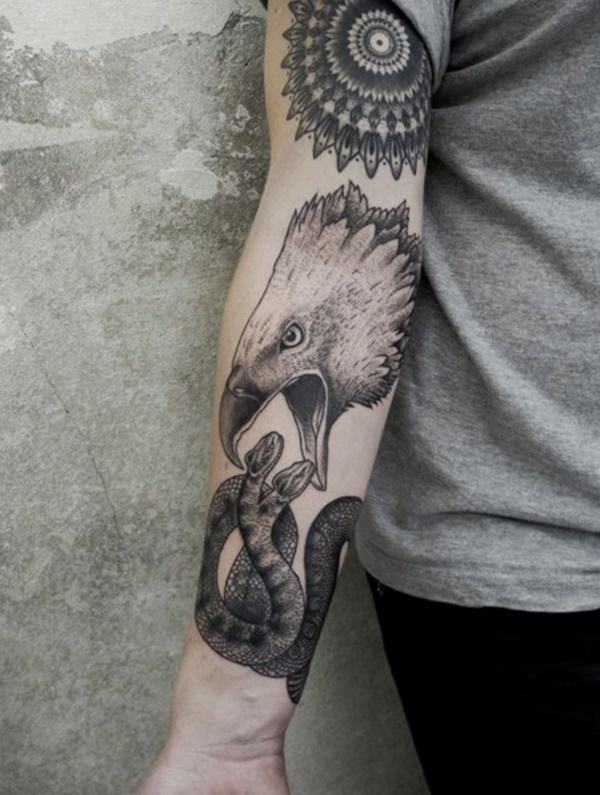 A traditional portrayal of an eagle at odds with a snake. Two opposing animals one considered a symbol of honor, the other a symbol of underhandedness. An abstract and colorful interpretation of an eagle. 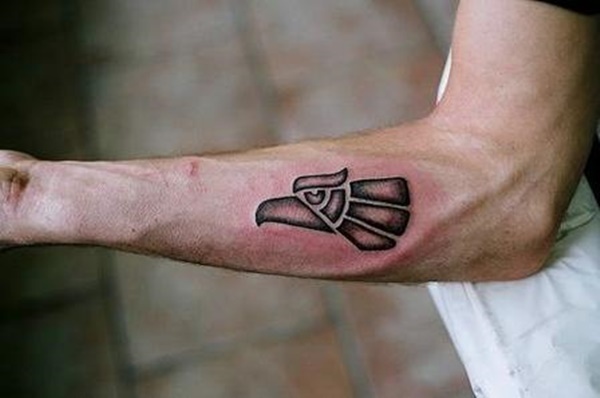 While the representation of the bird is relatively generic the appeal of this tattoo is in its placement. 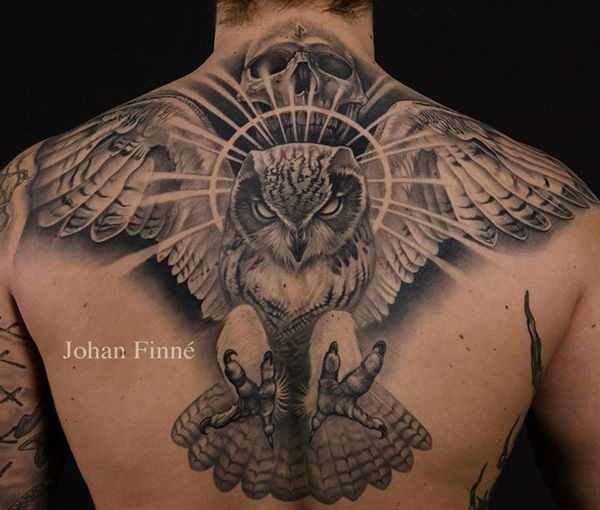 The bird is predominantly pictured on his rib cage but the wings ascend up the wearer’s back and accentuating the lines of his body. 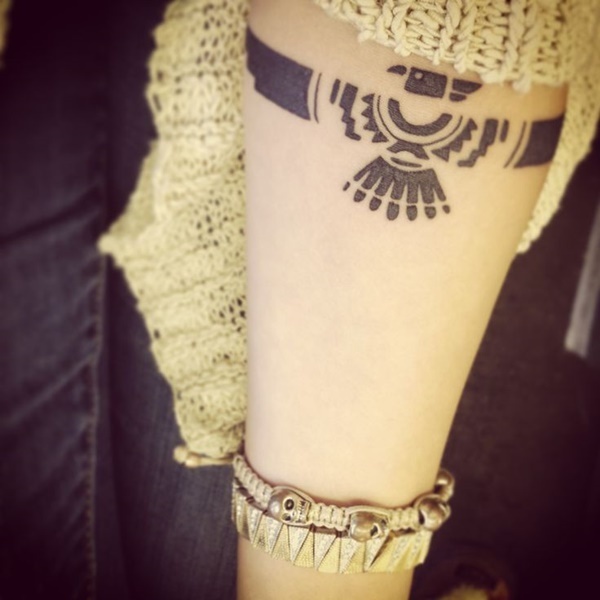 A different angle of a tattoo we saw earlier makes the Native American stylistic influences more evident. 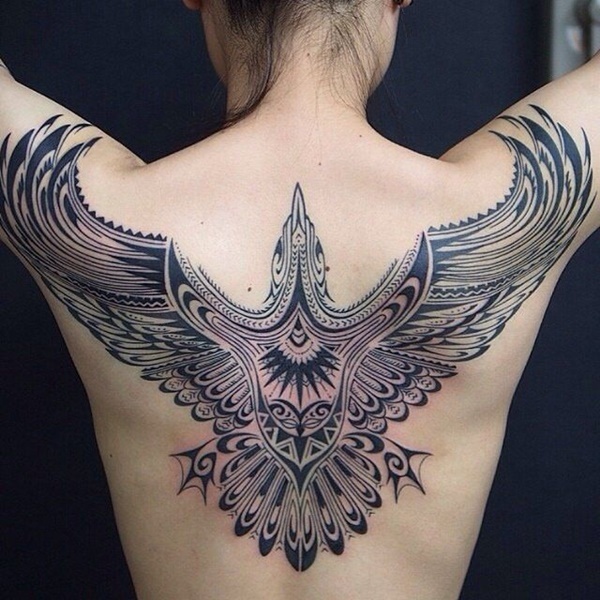 This is a beautiful example of a tribal top view of a bird in flight. 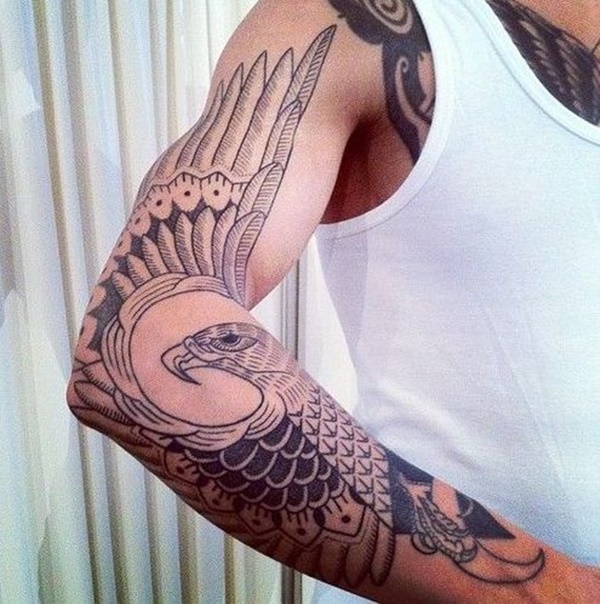 The subtle details of the patterns make this tattoo an exceptional example of the style. 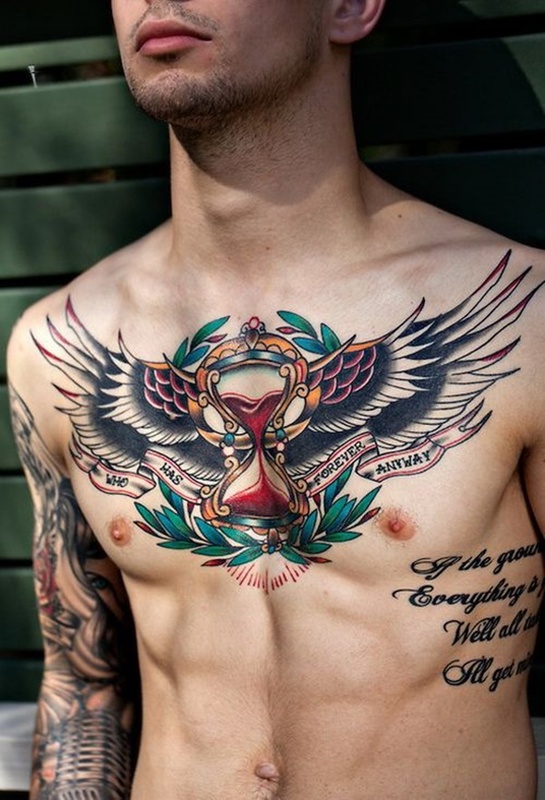 A remarkable use of color is the perfect compliment to the imagery of this tattoo picturing a hour glass with wings. The details of this subtle portrait create a sense of depth and life. 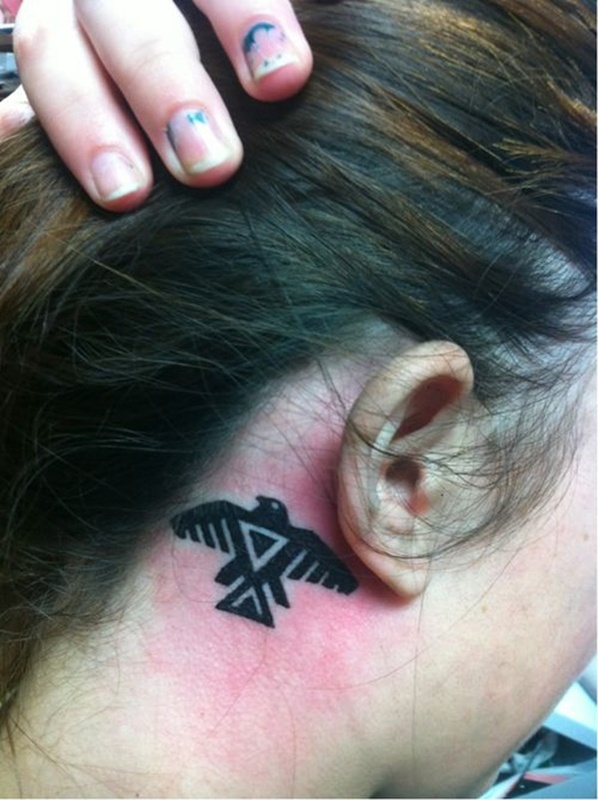 A basic, but well done tribal tattoo. 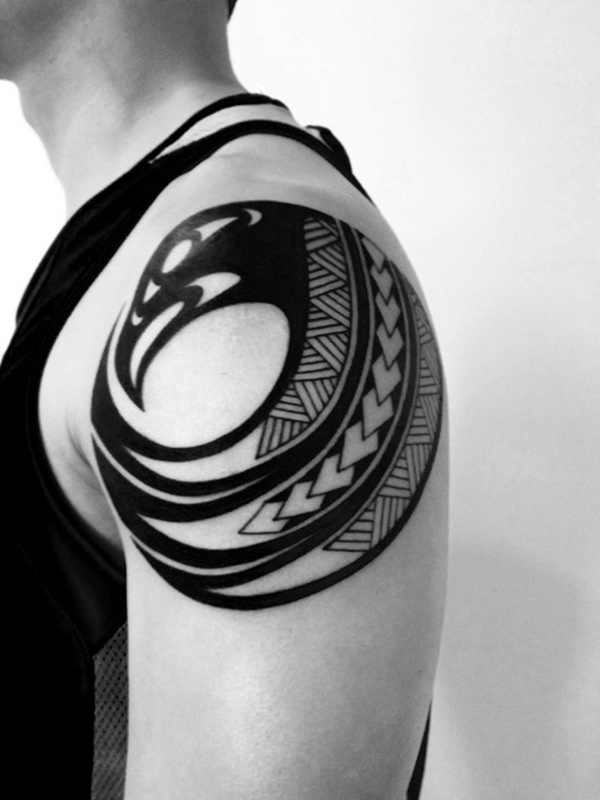 Sharp line work is essential to a good tribal tattoo. 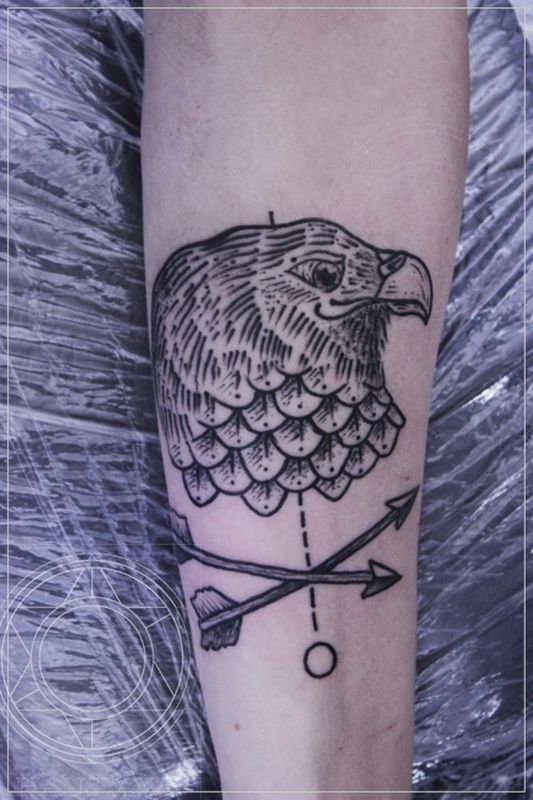 A tribal inspired illustration of a bird with overlapping lines that keep the tattoo from appearing mundane. 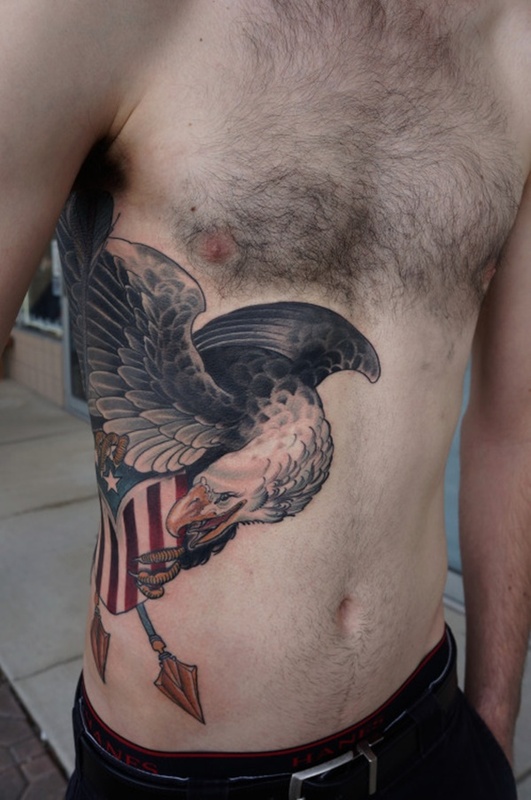 A well done ode to the portrayal of eagles so popular with American Navy Sailors. Notice the subtle yellow colors used in the beak, wings, and talons. 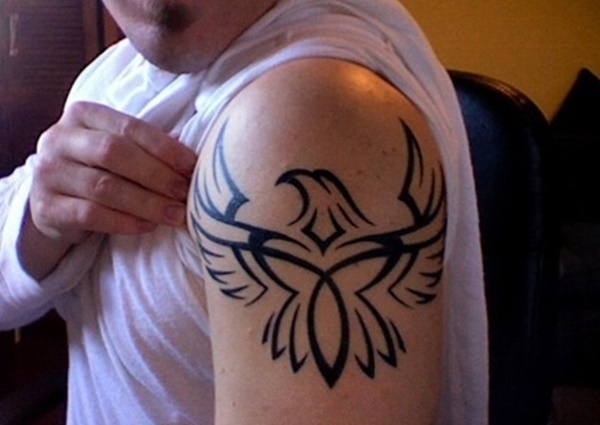 A simple tribal style profile of a bird’s head is complimented with superior shading. Take note of the gleam in the bird’s eye. Once again, line work is the secret to a beautiful tribal tat. A tribal style illustration of an eagle using traditional southwestern tribal colors. The birds head is enveloped in a larger image that frames the bird. A hyper-realistic portrayal of an owl swooping down on prey. 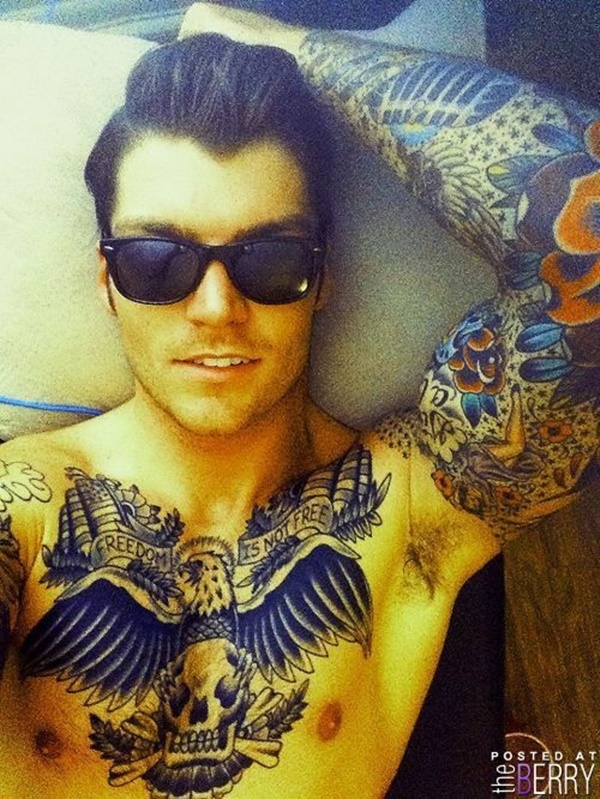 This is a phenomenal example of the artistic talent that exists in the tattoo world. A simple, black illustration of an eagle. Very reminiscent of eagles used in continental European heraldry. As mentioned earlier, birds were a prevalent symbol in ancient Egypt. 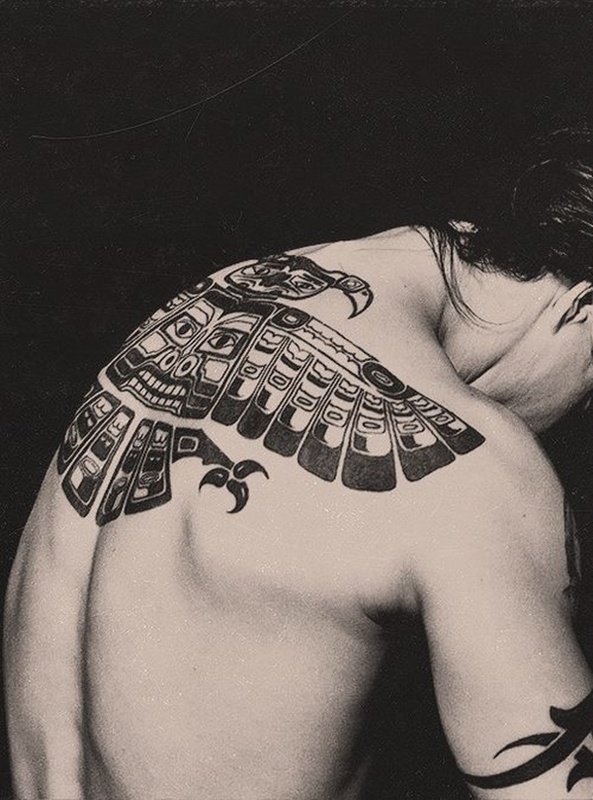 This tattoo portrays Egyptian royalty with wings of a bird. An eagle as portrayed on the German coat of arms. 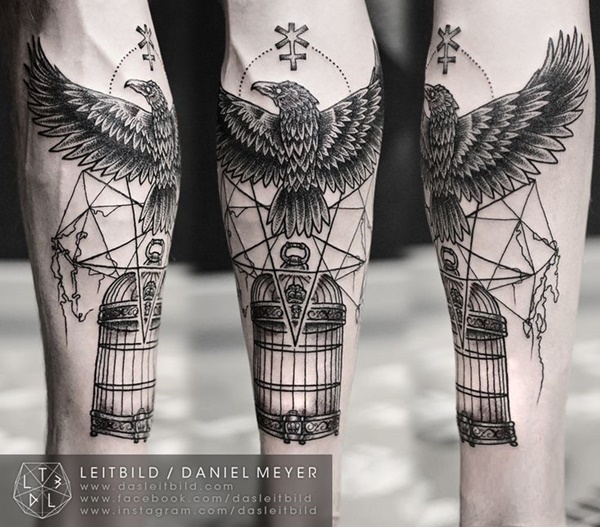 This tattoo differs from the other examples by fully realizing the birds instead of placing wings directly onto the hourglass. 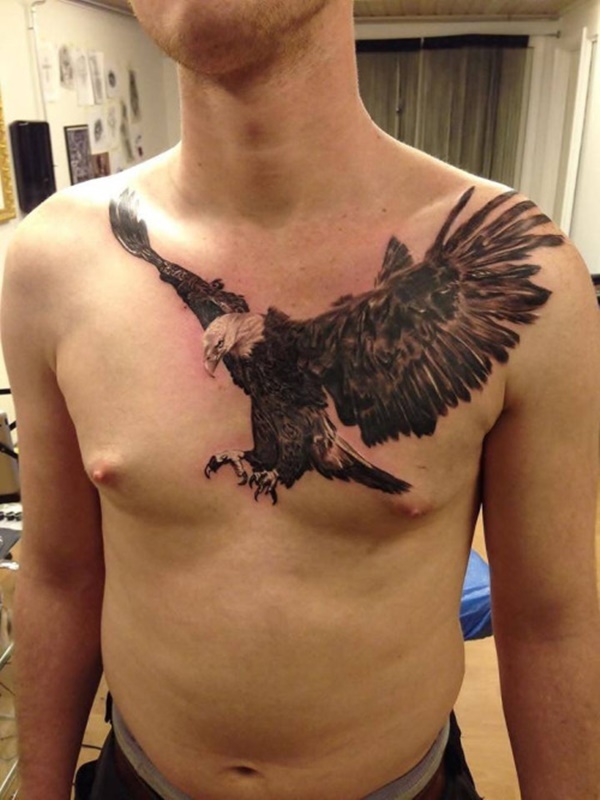 I suggest you avoid an eagle tattoo like this one. It’s asymmetrical and the failed attempt at illustrating wings looks more like a hair comb. 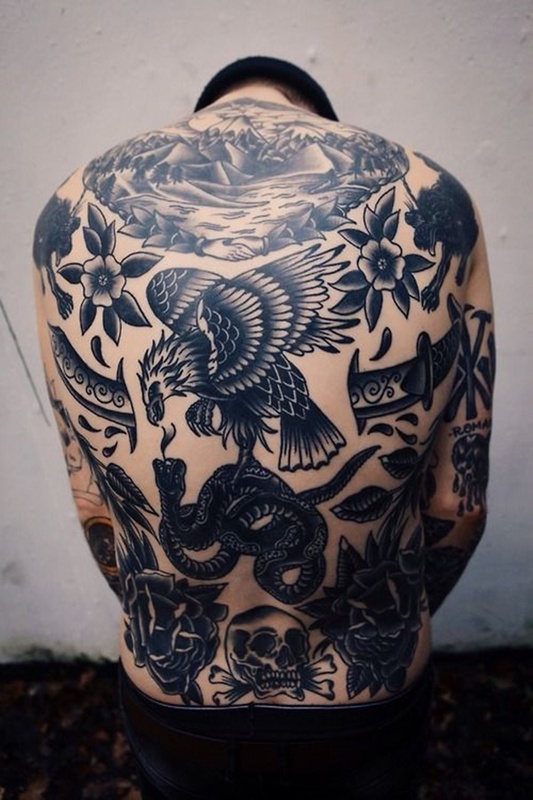 Doc Forbes is a legendary tattoo artist from Vancouver, Canada. 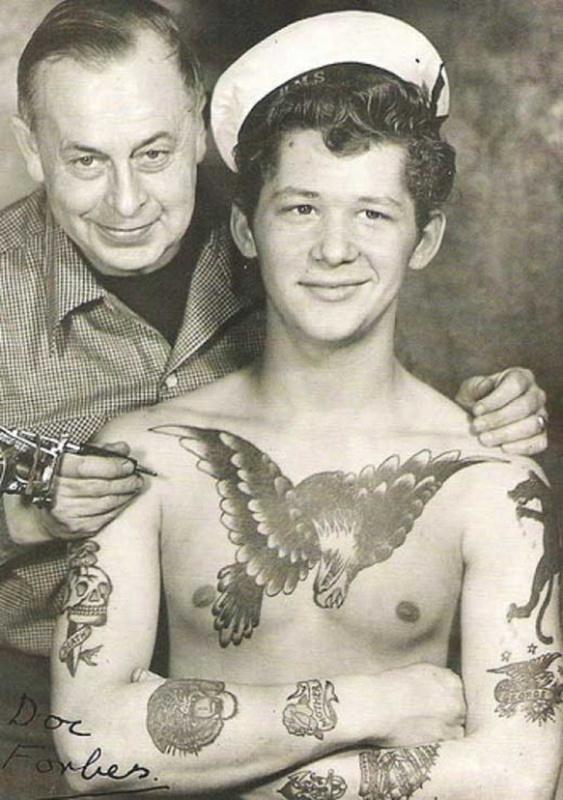 Here he poses with a sailor he tattooed with a craned neck eagle. While the eagle is in the typical heraldry position it is highly detailed and stylized. The shading and patterns add an intriguing element that draws the eye. A simply well drawn portrayal of an eagle swooping down on prey. Solid black lines detail the piece and manage the negative space. A traditionally styled illustration of an eagle defeating a snake, a symbol of honor overpowering deceit. 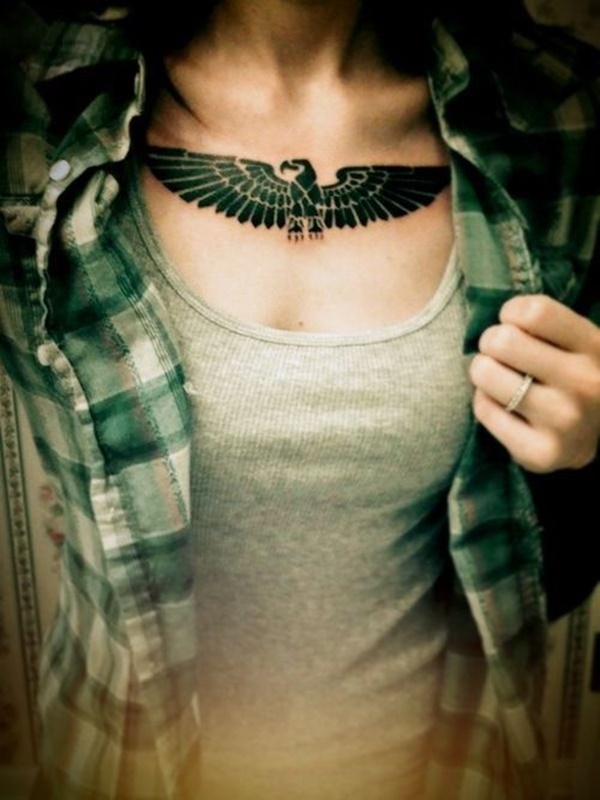 A realistically colorized image of an eagle in an unconventional but interesting location on the wearer’s neck. When she has her hair down the wings will peak out, hinting at her hidden artwork. 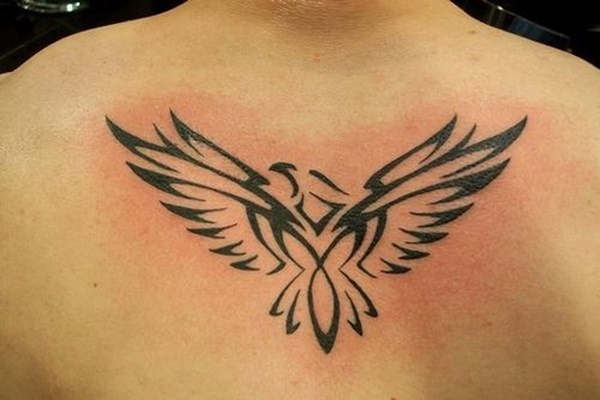 A stylized portrait of an eagle that covers the wearer’s entire lower back. 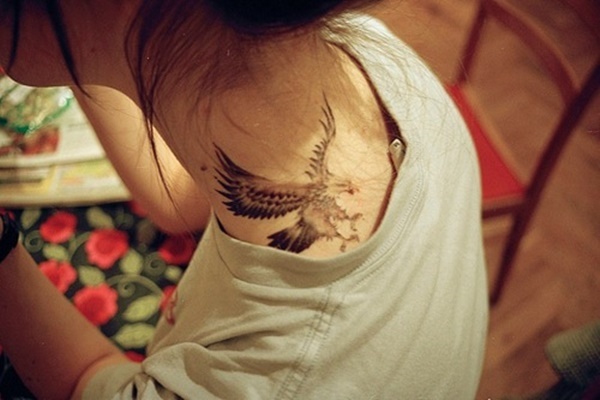 The wing descends onto her thigh and the rest of the piece wraps around her body. A visibly irritated eagle perches atop a bull skull. The four arrows protruding from the skull represent the North, South, East, and West. Traditional coloring and style superimposed over a red sun in the background. 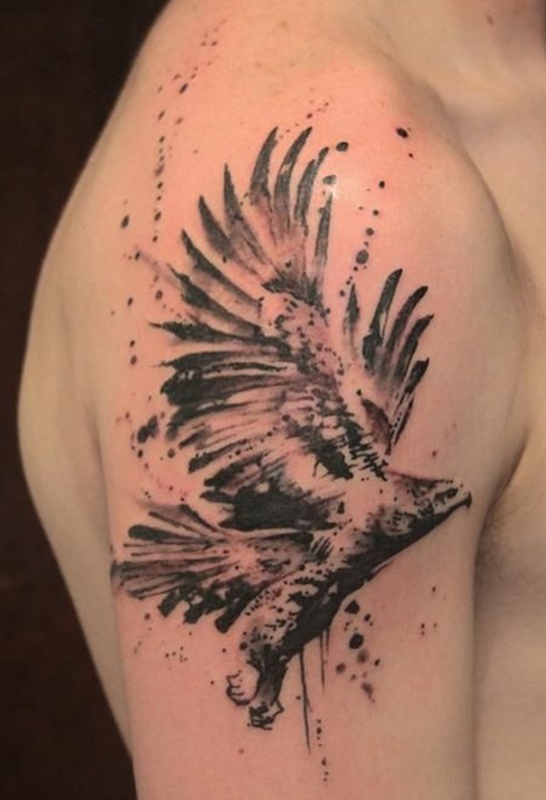 The lack of ink around the edges of the feathers creates separation throughout the wings and gives the tattoo character. A simple profile portrait of an eagle. The bird has a subtle smirk on its face and the dotted line leads to the four arrows once again representing the North, South, East, and West. Upper Thigh Eagle A well done illustration of an eagle swooping down on prey. The wings of the bird wrap around her thigh and follow the lines of her body as they lead toward her lower stomach and buttocks. 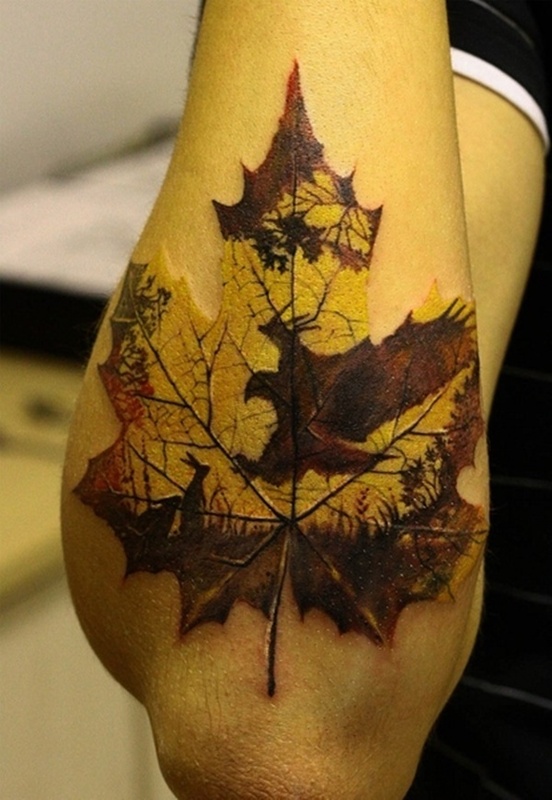 Using an earthy color palette of yellows, reds, and browns this tattoo depicts an eagle swooping down on a rabbit while the maple leaf frames the scene. My only qualm with this tattoo is the fact that when the wearer’s arms are hanging down by his side the tattoo will be upside down. 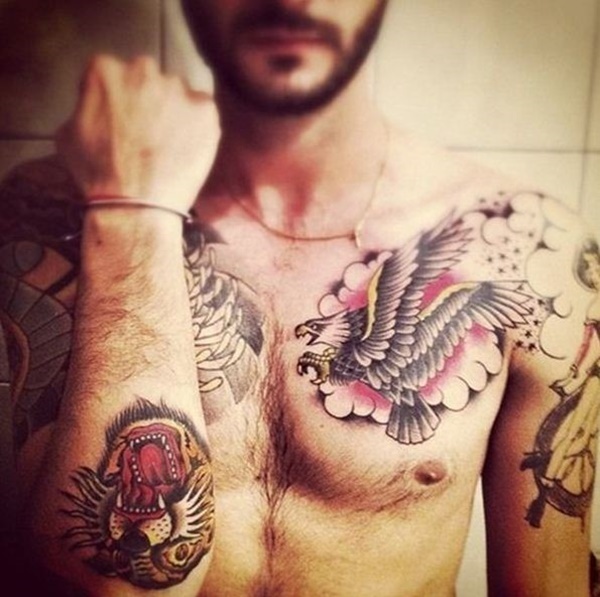 While the focal point of the tattoo is the traditionally colored and styled eagle the tattoos additional symbols are relevant to its meaning. The shield (not surprisingly) represents protection while the wreath in the eagle’s claw represents peace. 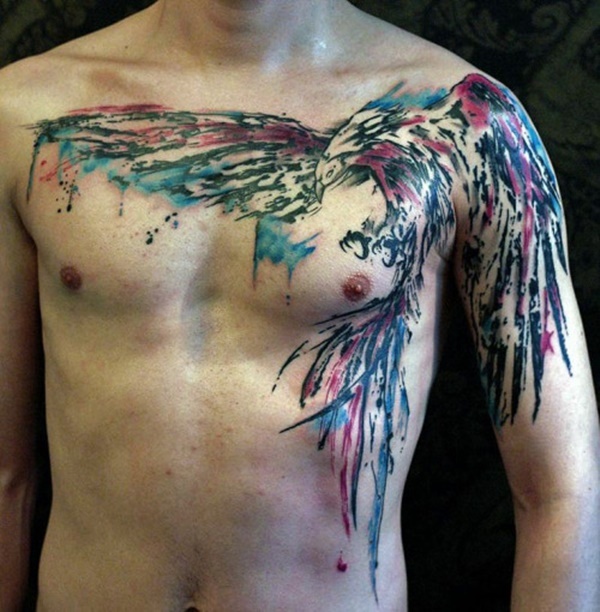 The vivid color palette of this tattoo creates an undeniably attention grabbing piece. The subtle details on the head of the eagle are the distinguishing features in this realistic portrait. 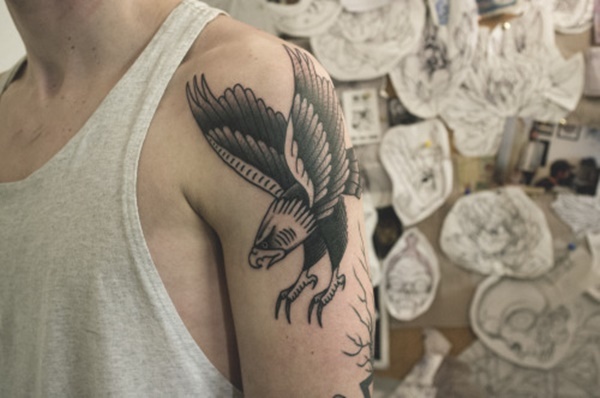 While the style of the eagle is consistent with traditional tattoos, the lack of color creates a unique distinction from the other traditional eagles on the list. 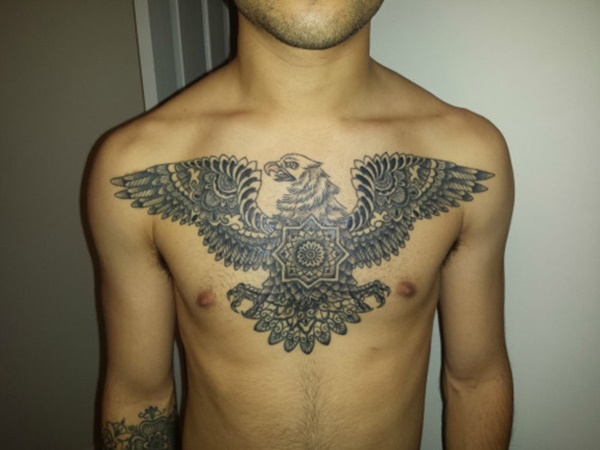 A full chest piece depicting an eagle with spread wings is nothing original. 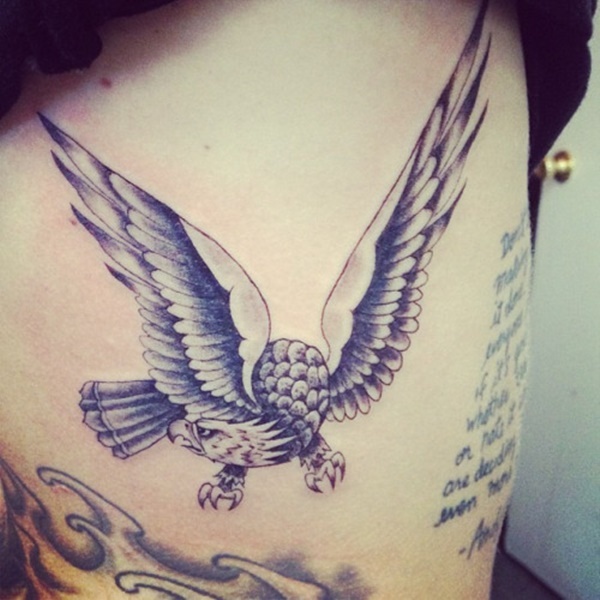 However, the distinguishing factor of this tattoo is the patterns in the body of the eagle. In the center we see a shape similar to an Indian mandala. A hyper-realistic portrayal of an eagle biting down on a pair of snakes. 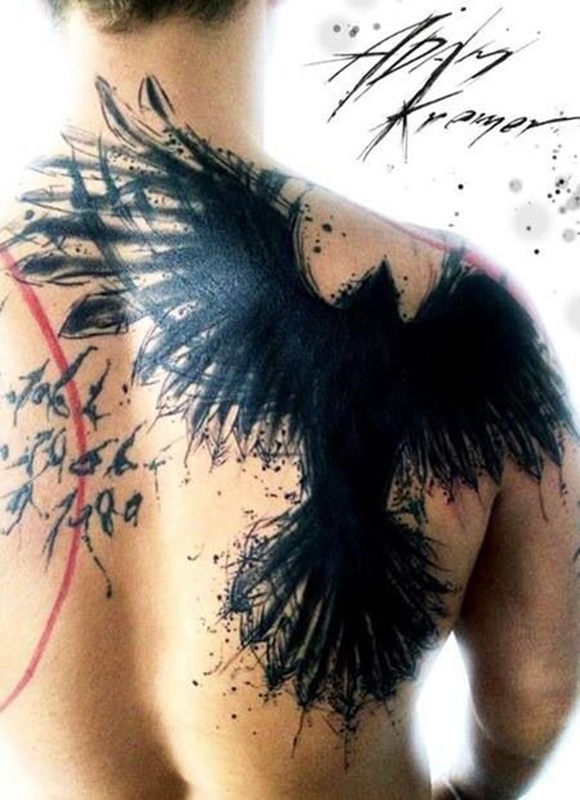 The sophisticated use of shading creates the realism that makes this tattoo astounding. 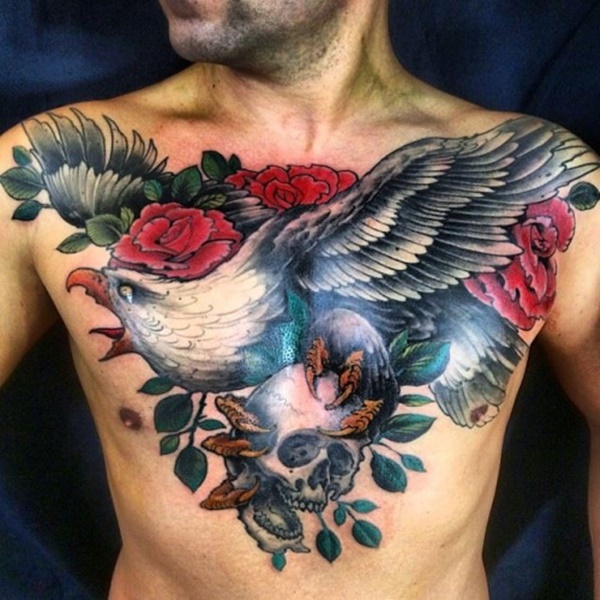 While the images in this tattoo are typically associated with the traditional style, in this piece we see a modern flare on traditional subjects. 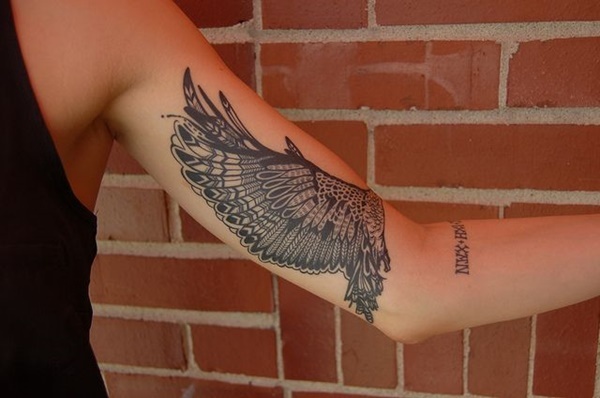 The tattoo does a great job of exhibiting a level of detail not typically represented in traditional ink. 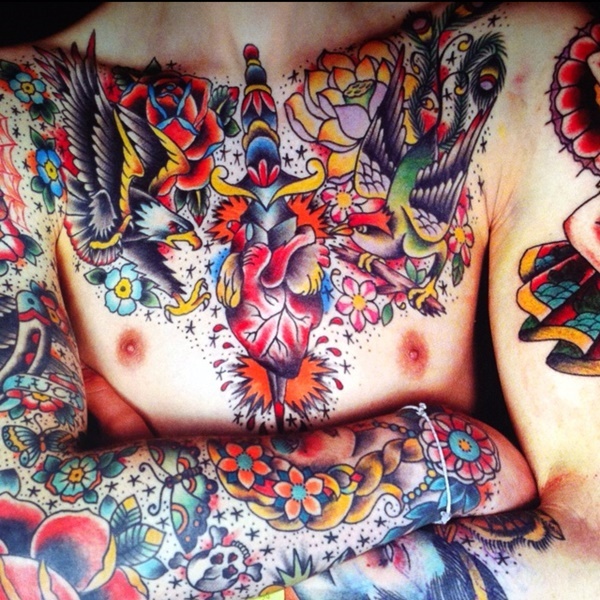 The colors, style, and background are indicative of traditional tattoos. However, the neck placement adds a certain character to this piece that separates it from a similar image on a more traditional body part. Once again, the emphasis on this tattoo is on its placement. While the image portrays a rather typical eagle, the placement has the talons leading into, and drawing the eye to, the girl’s cleavage. 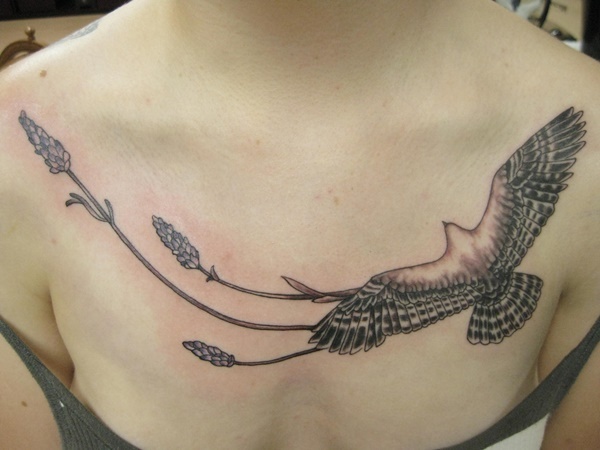 A traditional illustration of an eagle is the focal point of her tattoo collection. 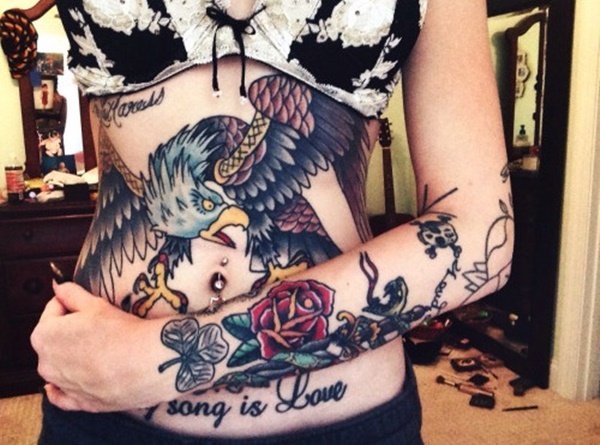 Notice the head of the eagle stops directly above her belly button to create a sense of symmetry. This piece uses a limited color palette. The blue and red are used to accent the black ink and are distributed in a way that simulates watercolor paint. This surrealist piece merges mountaintops into the head of an eagle. The careful detail creates a sense of unity and separation as the transition from mountains to eagle are seamless but easily distinguishable. A beautiful example of using the ink splatter style to create a detailed image. The rich black contrasts with the wearer’s skin tone while the grays soften the image and its stark contrast. 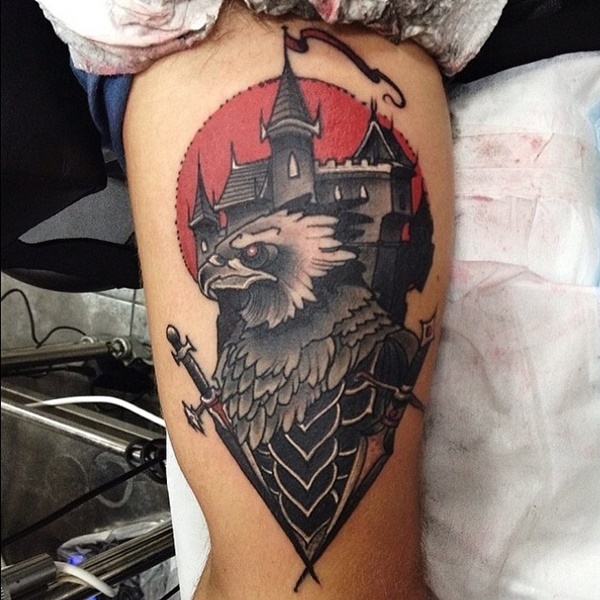 This tattoo exhibits influences from traditional eagles, heraldry and the artist’s preferences. 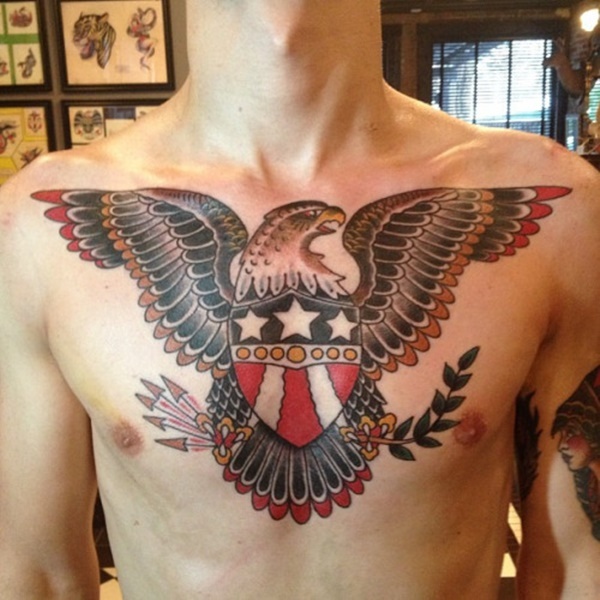 The eagle’s tongue is sticking out, a nod to heraldry. The embellishments on the tail are reminiscent of Native American art while the wings and head are shaped like a traditional eagle. While this stencil shows promise it is far cry from a completed tattoo. 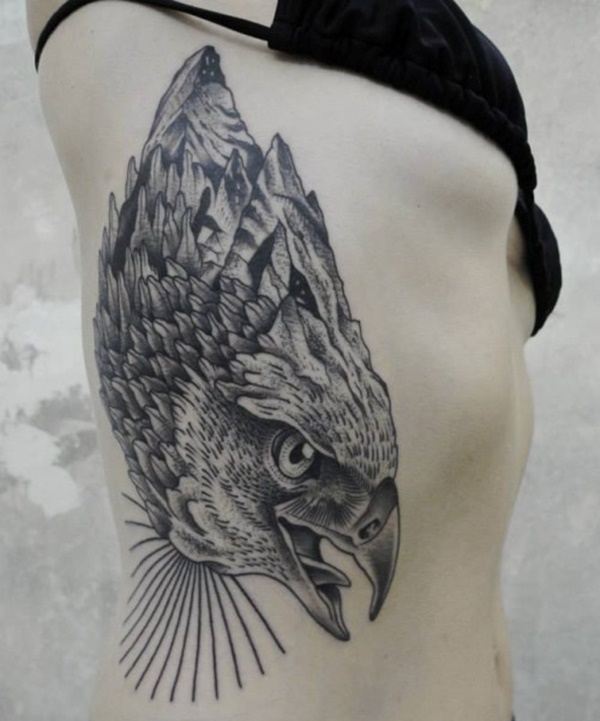 The eagle is incredibly detailed and the arrows sticking out of the bird’s back are intriguing. 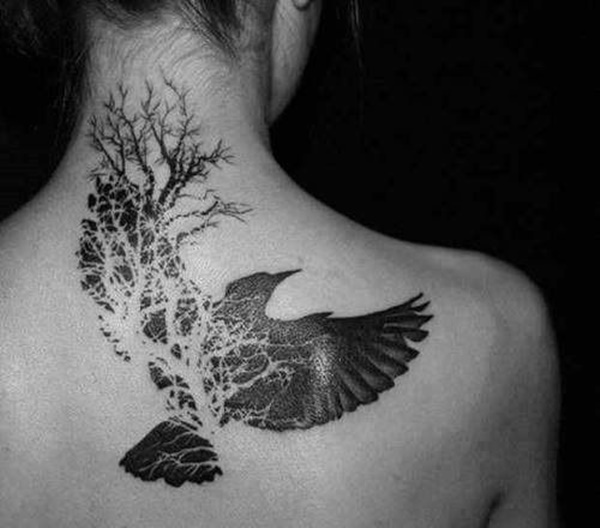 However, without any ink laid down this tattoo is still conceptual, albeit a concept with significant potential. A great example of a hyper-realistic portrait. The detailed coloring in this piece is the defining factor of its quality. While the artwork is incredible, I question why the artist refrained from making the eagle’s talons yellow. 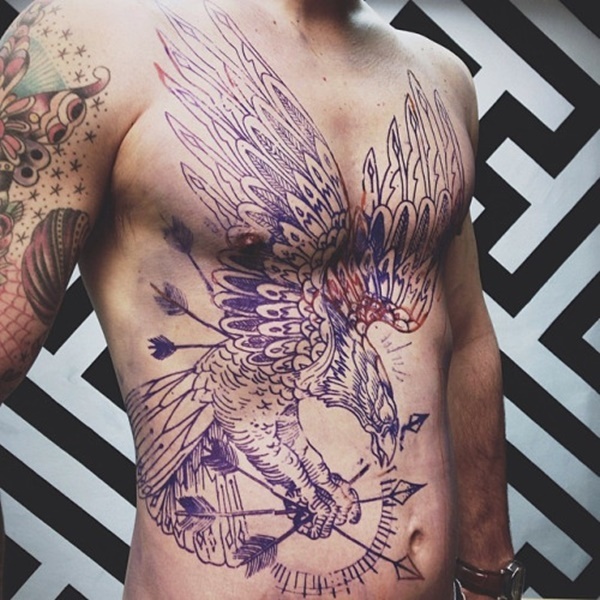 This tattoo has traditional subjects with an updated style. The Arrows are highly detailed and the head of the eagle is almost dragon-like with an extended tongue. A commendable feat as the artist seamlessly merged his modern style with traditional imagery. A back of the head tattoo is a bold decision. 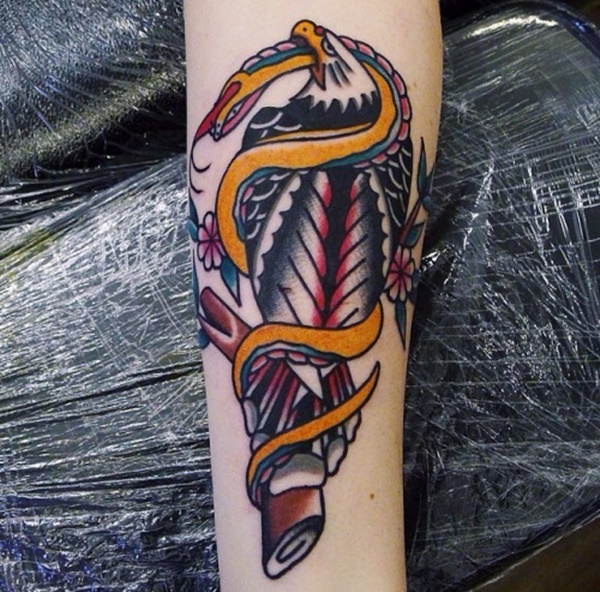 Once again we see a traditional style portraying an eagle fighting a snake. 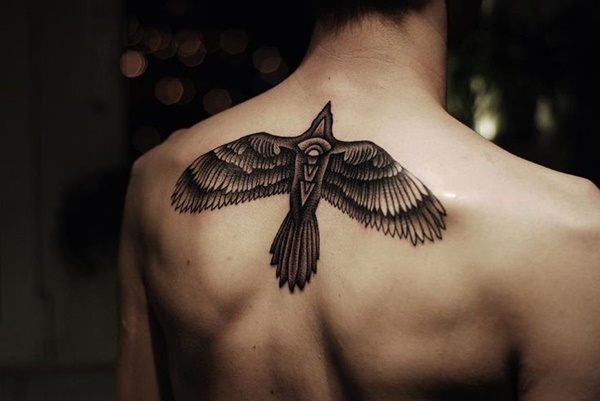 The tattoo is a little confusing as the two animals are wrapped up and the eagle’s wings point in two different directions. While the use of traditional colors is endearing, I believe the artist was too heavy handed with the black ink and has overpowered the details of the piece. 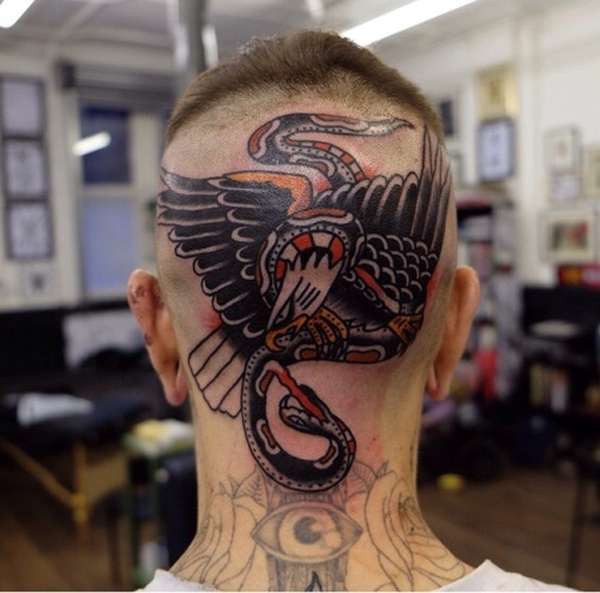 In a traditional style we see a top view of a snake wrapped entirely around an eagle. A good use of color creates a distinct separation between the two animals and carries well throughout the piece. While I think the eagle and skull are well done, the roses are a bit skewed towards the center and create an heir of sloppiness. Traditional styling and vibrant colors are the common denominators of this woman’s tattoo collection. The tattoos are well done, giving a nod to traditional styling and subjects while retaining a twist of individualism so crucial to the wearer. Superb placement is the crowning achievement of this tattoo. While The positions of the eagles differ, the lines of the illustration follow the wearer’s back well and create a scene rather than two separate images. 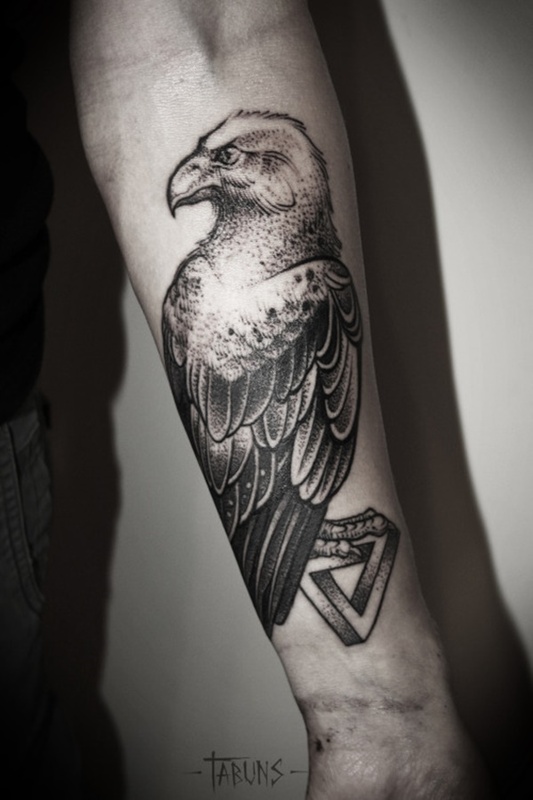 A respectable black and grey variation on a traditional eagle tattoo. I’d like to note that the placement is arguably the most traditional place for a tattoo, as the upper arm has been a tattooing placement staple for decades. 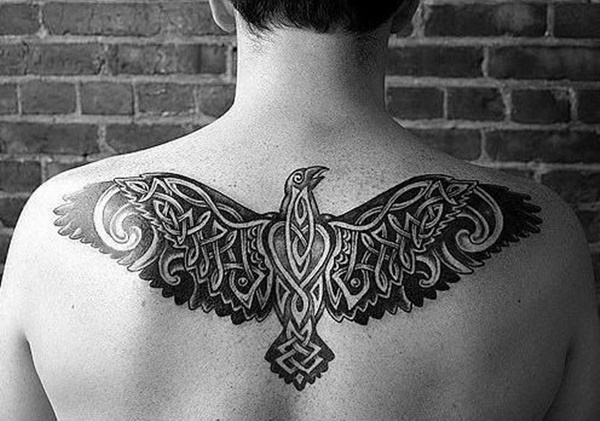 While the body of the bird is in a Native American style, the tail of the bird done in a style similar to a Celtic knot. While the styles differ they don’t clash and the piece is well portrayed. While similar in style and coloration to the other examples of traditionally styled tattoos we have on the list this tattoo sets itself apart through detail. The top row of feathers are embellished and the yellow ridge that runs along the top of the wing has a wave pattern. The roses are colored and shaded creating depth in the flowers. 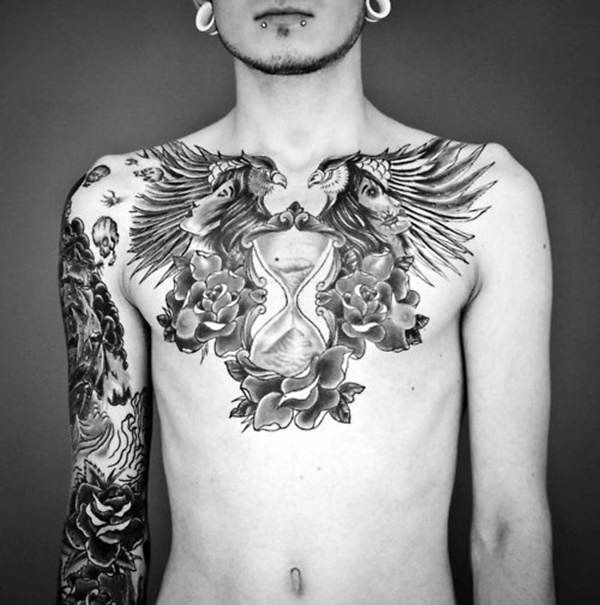 This tattoo is a prime example of the fact that the artist is as important as the style and subject.